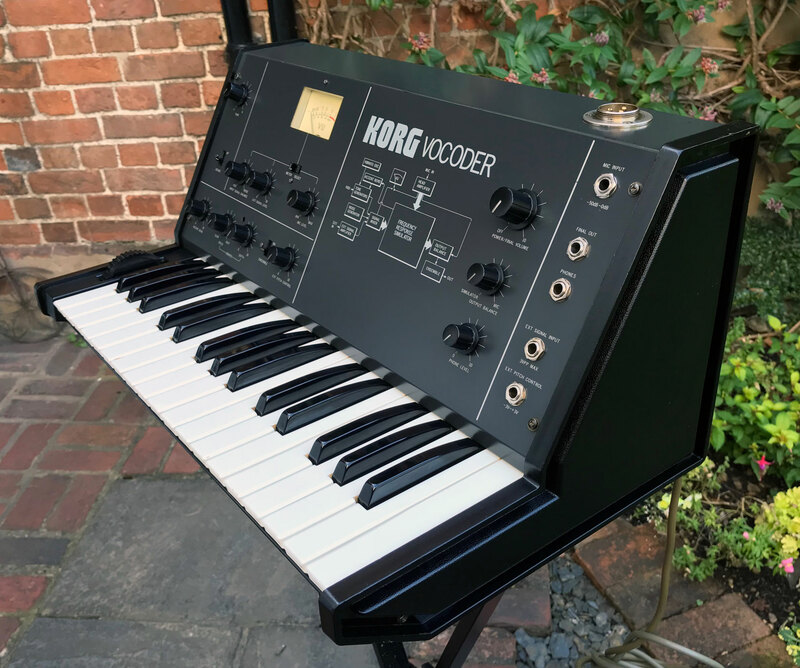 Came into stock: Available from RL Music as at 9th January 2019. 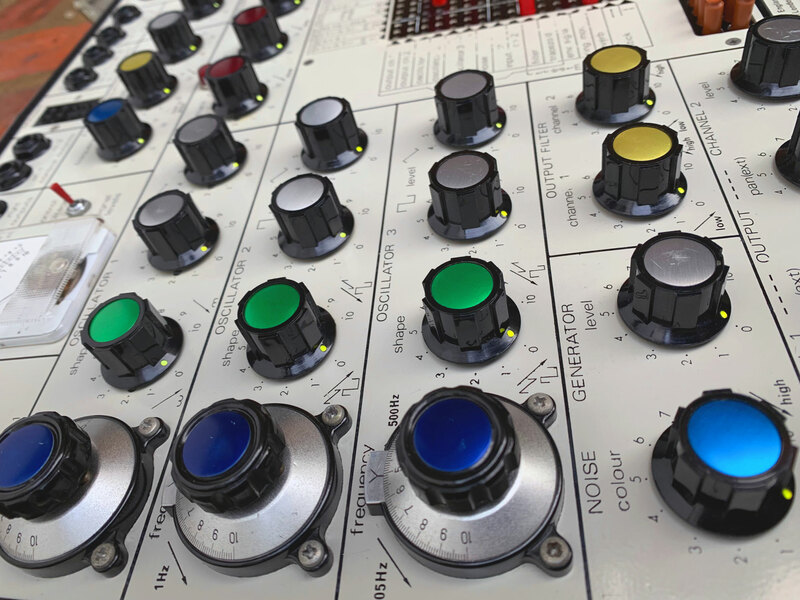 Servicing Status: A full health-check by KSR will be carried out post-sale but this Synthi was fully serviced by EMS in October 2016. 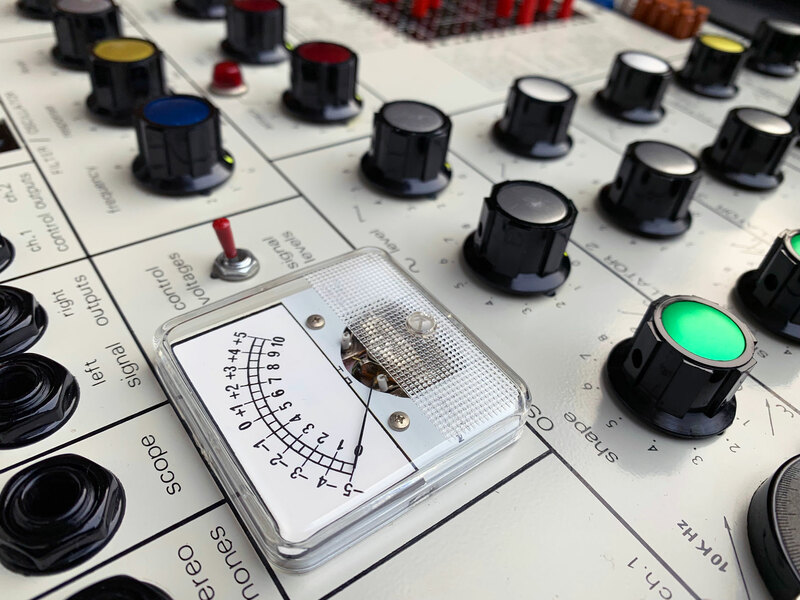 Remarks: A fabulous opportunity to own a vintage EMS Synthi, and this example is in super all original condition throughout. 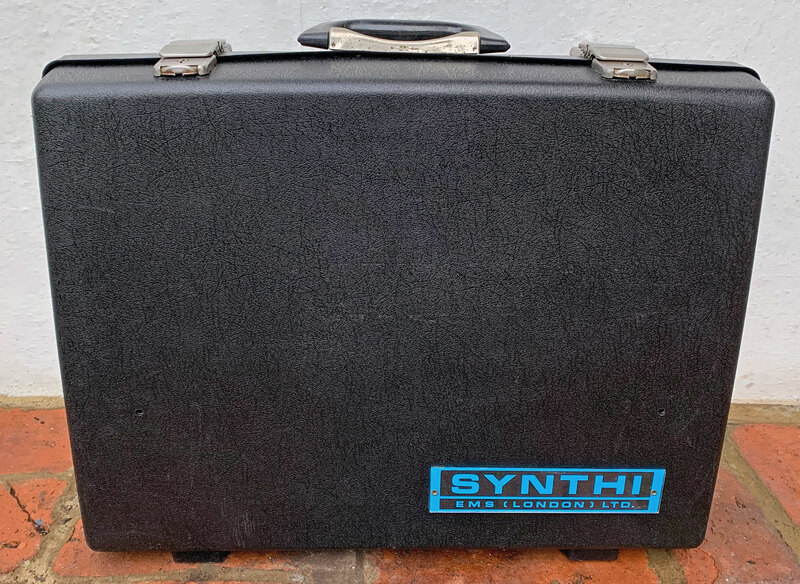 This Synthi (serial #4656KS) was purchased brand new by our client in 1973 so they are the original and only owner of this instrument. 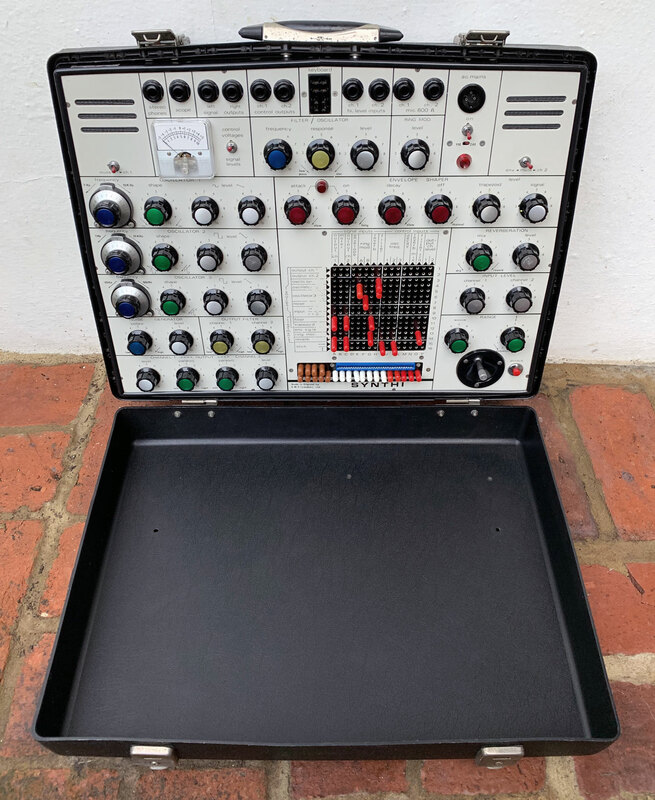 When purchased, this was a (complete) Synthi AKS model and therefore had the Keyboard Sequencer (KS) controller, but our client sold that some decades ago so it no longer comes included with this, hence it’s been advertised as only a Synthi, or Synthi A. 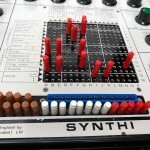 There have not been any modifications made to this Synthi so it’s factory spec. 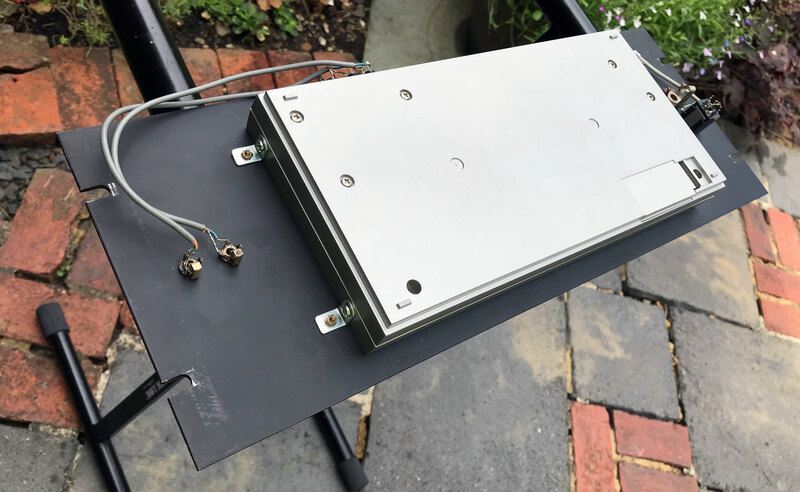 One advantage to it being an ex-AKS model is that the PSU is rated to easily run external devices like the KS or DK series controllers. 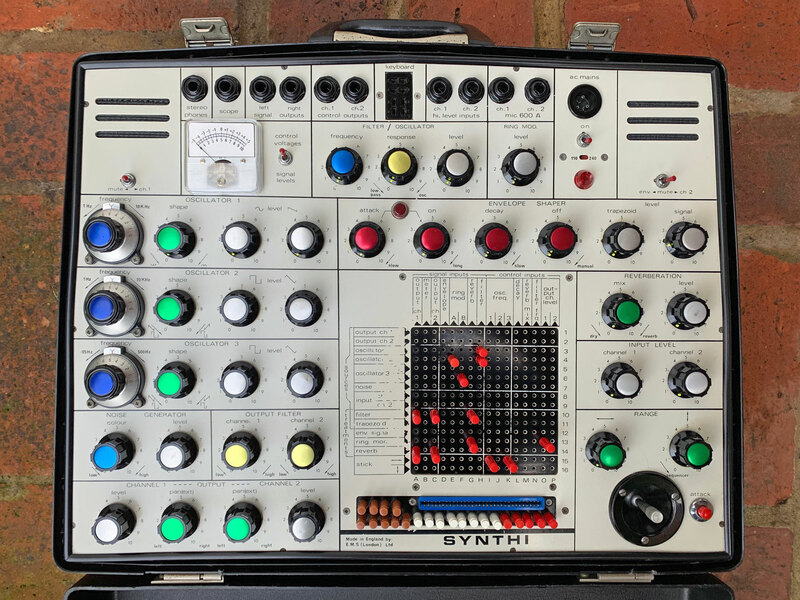 Since 1973, this Synthi has been in regular home use only, and the owner decided to have a detailed service carried out by Robin at EMS in late 2016. 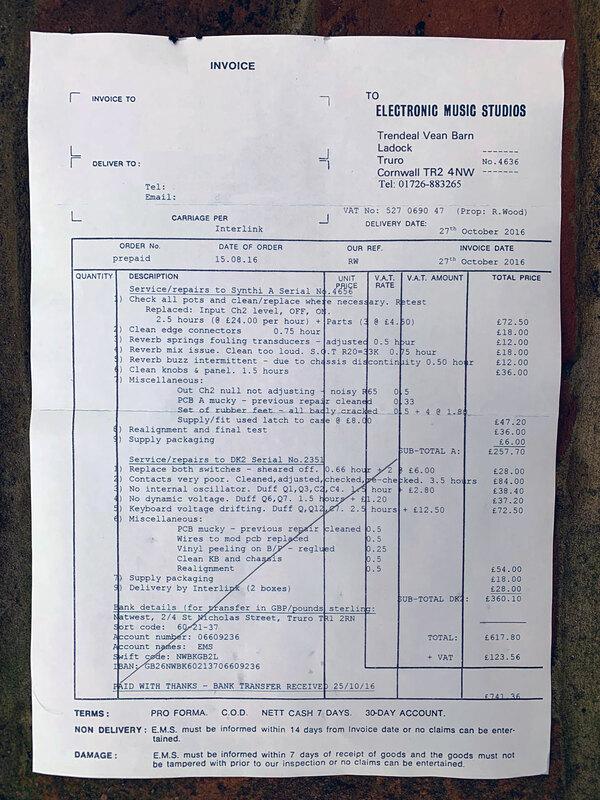 We have the original EMS service receipt which we have scanned and made available to view below so you can see what was carried out. 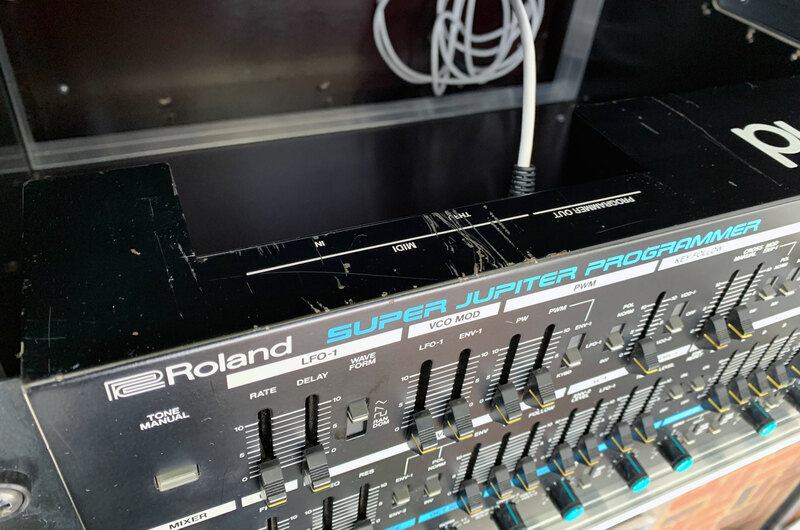 The cosmetic condition is very good indeed, with only some wear to the screen-print along the matrix, which is not unusual. 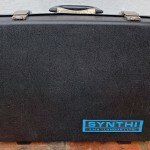 Both Spartanite cases are in excellent condition. 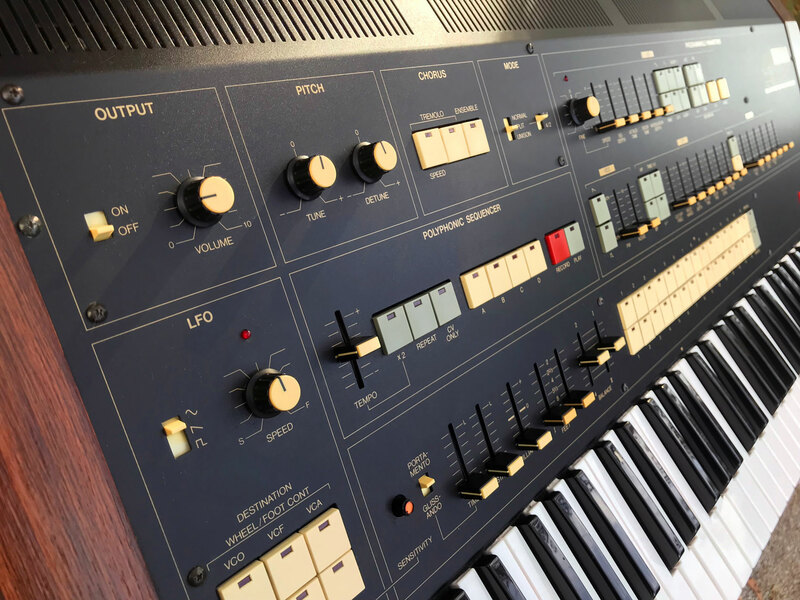 The nickel latches & hinges show signs of oxidisation, which again is normal to see on a 45+ year-old synth, although they easily could be improved with some light restorative work if needed. 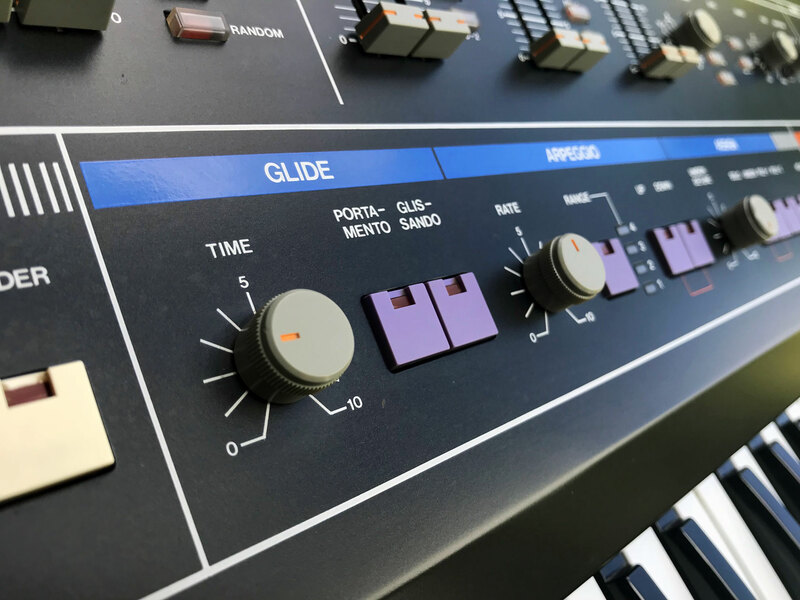 In all, the instrument shows normal signs of ageing and has not any overt cosmetic restoration carried out, which we know for many people is important in terms of retaining authenticity. 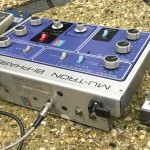 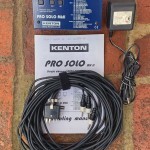 Included in the sale (pictured), is a nearly-new Kenton Pro-Solo Mk2 with PSU and required cables to carry CV/Gate/Filter (cinch-jones connector) to operate this Synthi via MIDI. 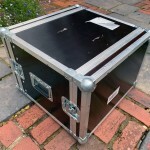 These are all included in the price, and worth around £200 GBP if purchased new/separately. 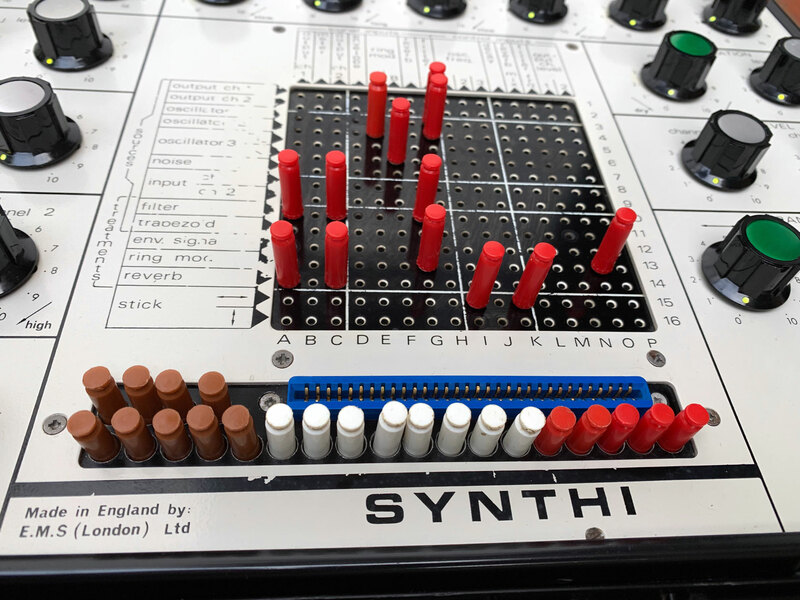 This EMS Synthi comes with way more than a full set of matrix pins, 35 in total, and 16 of them are brand new (all red), so the pin situation is covered. 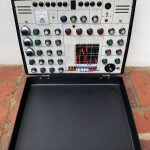 KSR will give this Synthi a full health-check post-sale, but we have tested it extensively and can confirm it’s working perfectly, as it should really as Robin did all the refurbishment work only a couple of years ago. 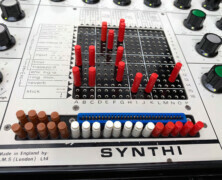 This Synthi is set to operate on EU 220V~240V (front-panel setting). 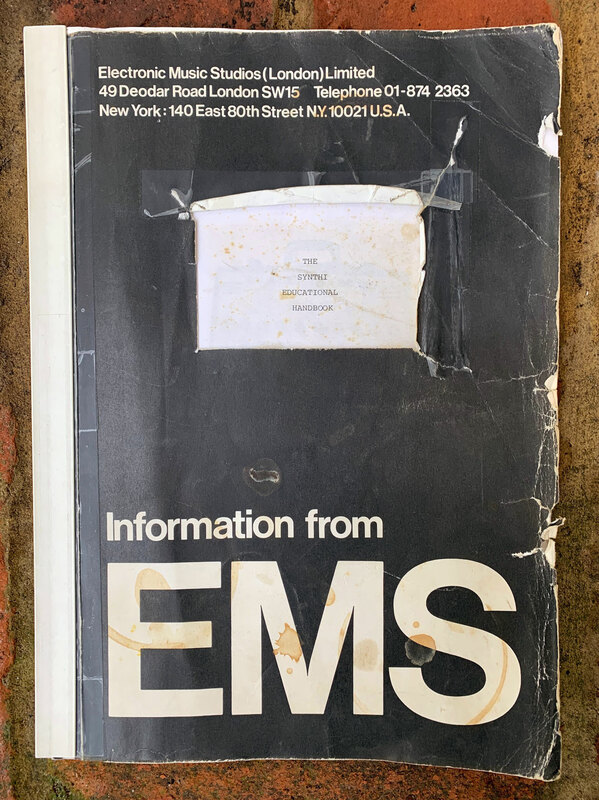 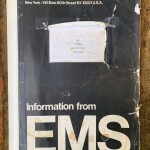 We were also supplied with the original EMS ‘Education manual’ for this model and the proprietary EMS power-cable (with UK 3-pin plug fitted). 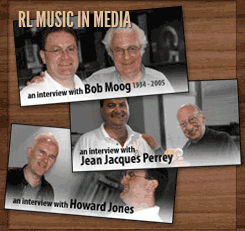 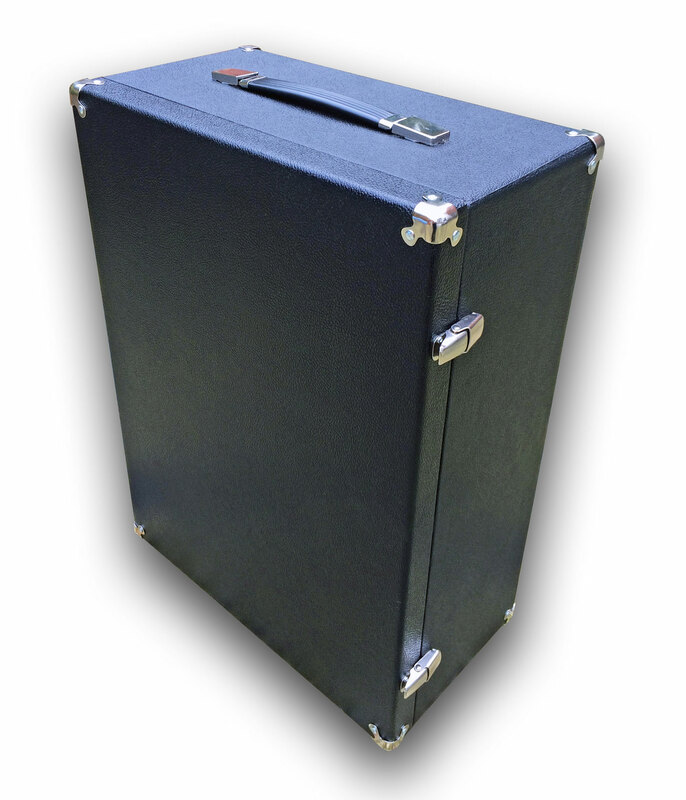 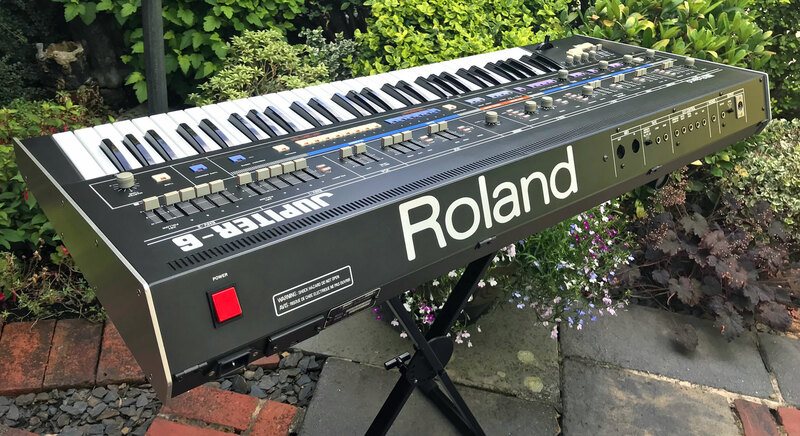 As the instrument is being Brokered through RL Music, it will be sold with a full 3-month warranty and we can ship worldwide. 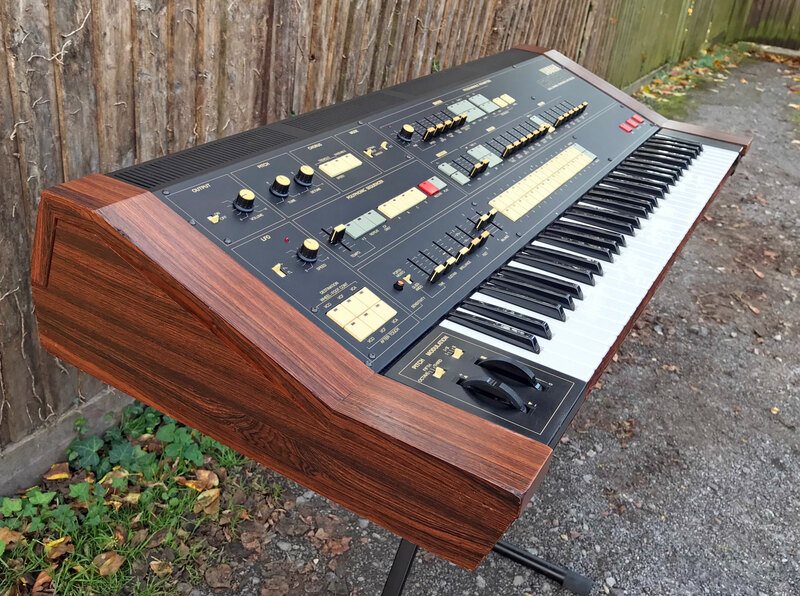 As with all Brokered Sales, the synth will be fully health-checked post-sale, before it’s sent to its new owner. 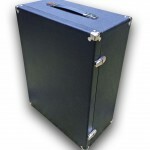 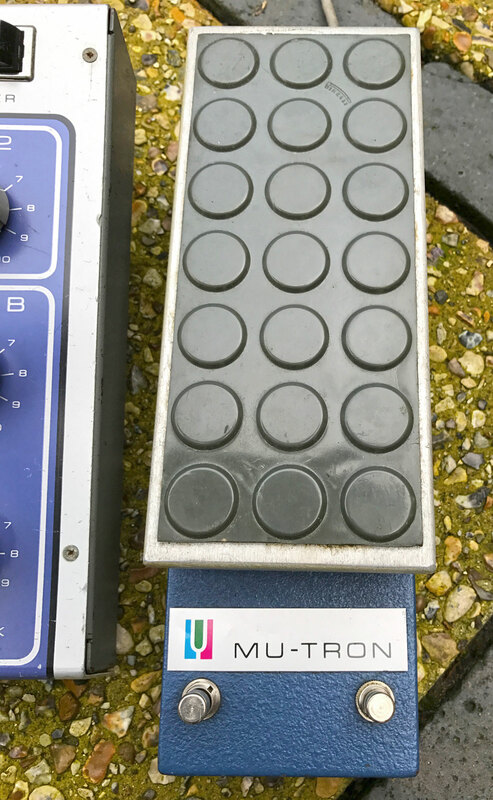 We do this to ensure that the instrument leaves us in perfect operational condition, and it is backed up by our full warranty to give the new owner complete peace of mind. 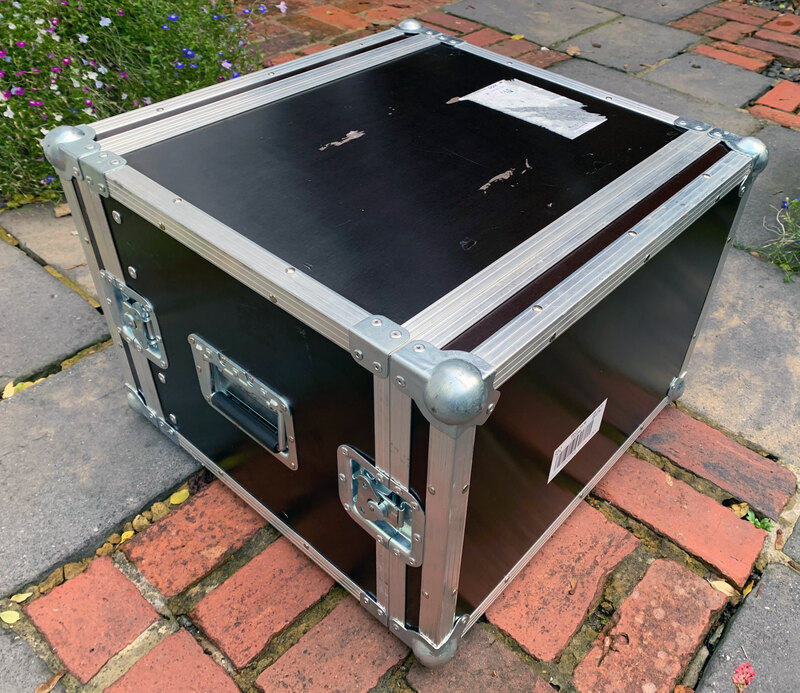 The work is carried out as a priority once the sale has been completed, and although it will delay shipping/delivery by a short time, we know from experience that customers are happy to wait. 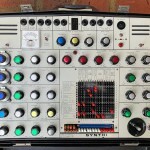 Availability: This EMS Synthi is available for sale now and can be reserved on deposit (20%). 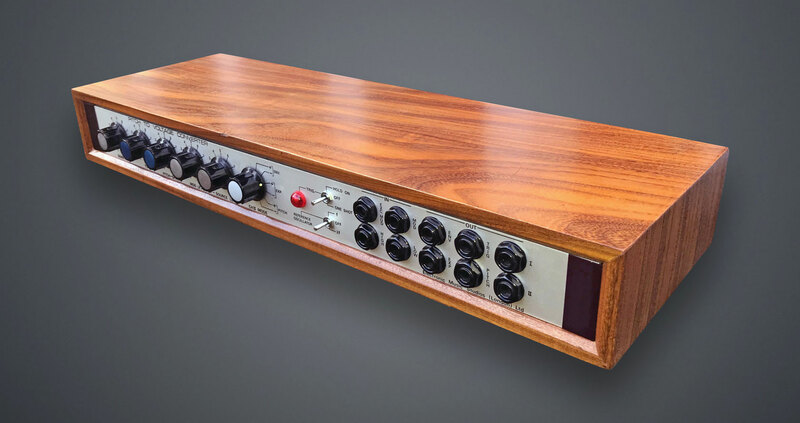 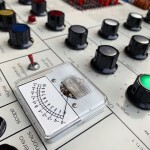 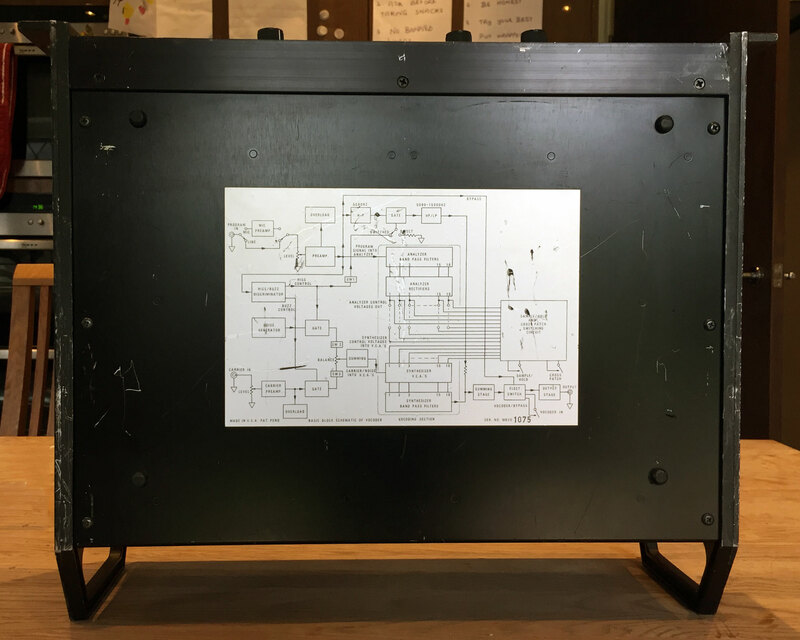 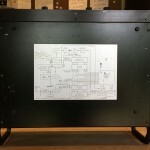 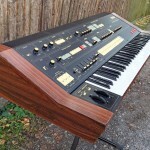 Click on the thumbnail for higher resolution photo of the actual Synthi for sale. 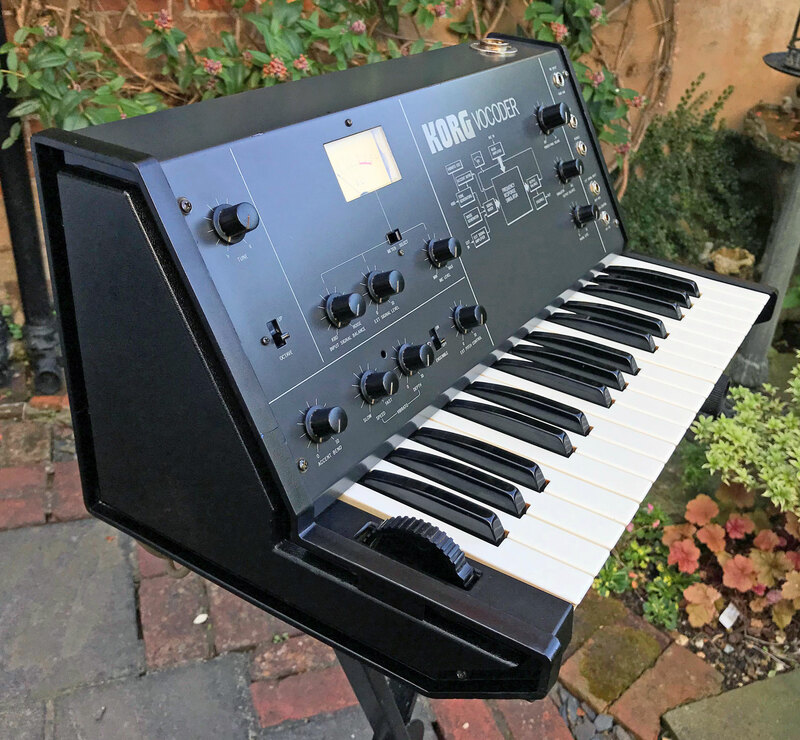 Came into stock: Arrived at RL Music in November 2018. 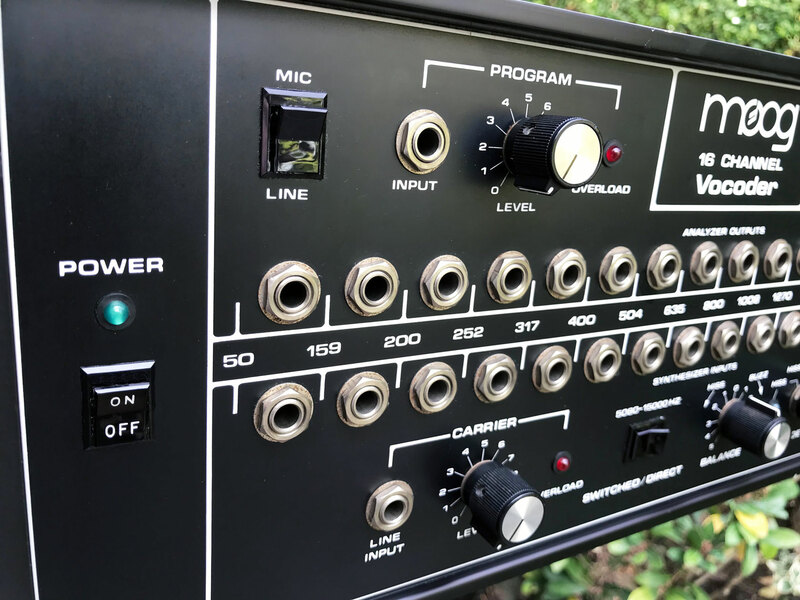 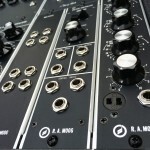 Remarks: The classic rack polysynth combo is considered by many enthusiasts to be one of the best sounding vintage analogue rack-synths ever. 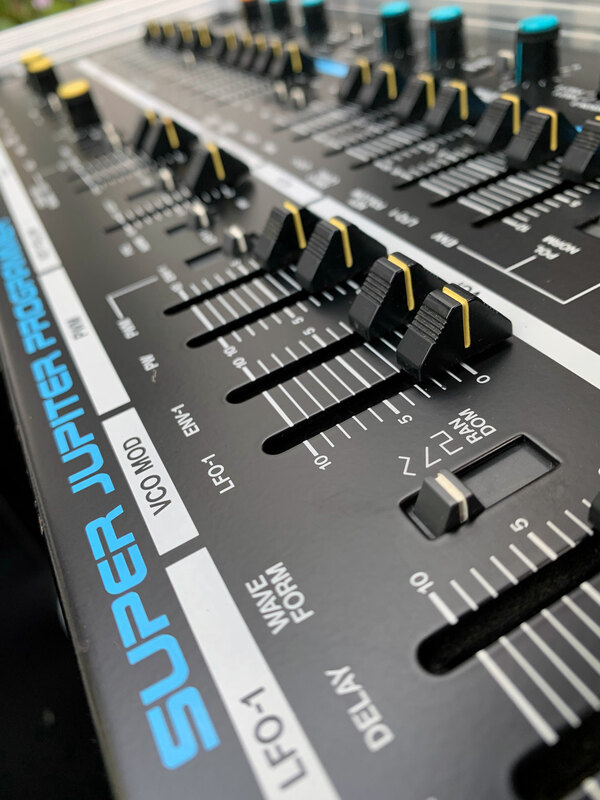 The MKS80 Super Jupiter is powerful velocity and pressure sensitive 8 voice/16 VCO analogue polysynth with that big vintage Roland sound, and a stack of modulation and editing facilities. 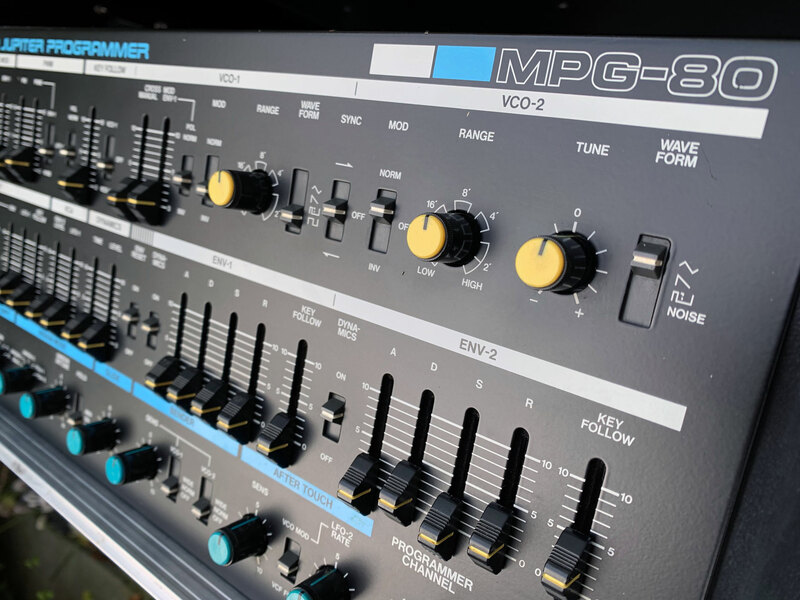 The accompanying MPG80 controller is an essential piece of kit if you want to really dig down into the programming and open up the synths capabilities, and is a joy to use. 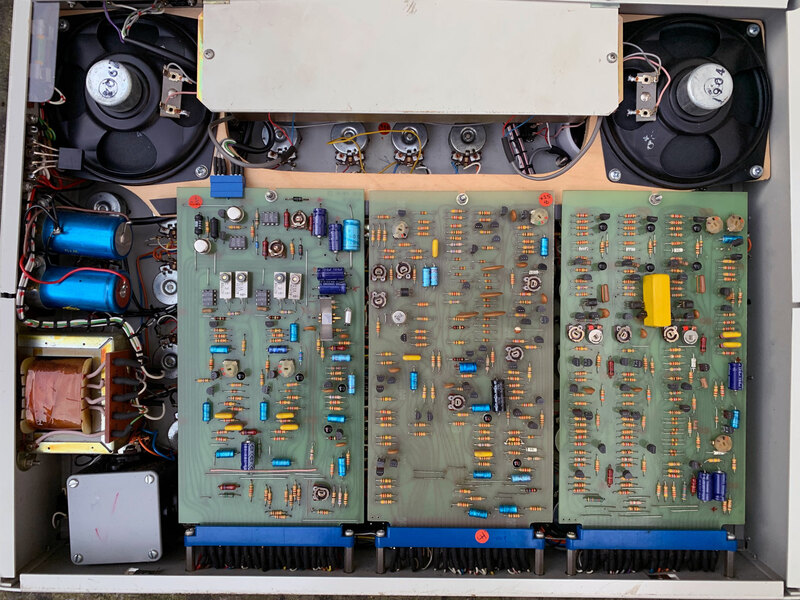 This unit (serial #713737) is the much sought after Rev.5 version of the MKS80 (see PCB pictures below) featuring the Roland IR3R03 VCO and VCF/VCA IR3R05 chipset, amongst other architectural differences to the earlier versions. 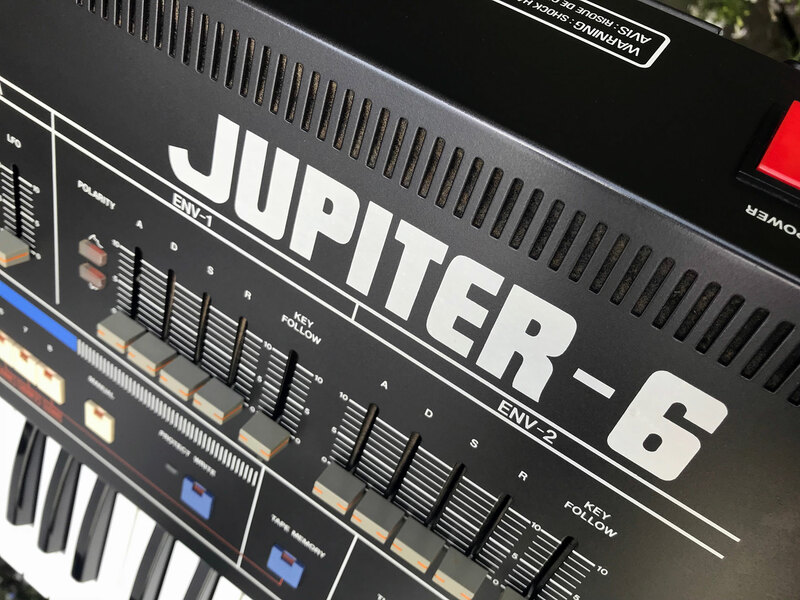 Many say the Rev.5 comes closest to sounding like the Jupiter 8, but we’ll leave that debate to the internet to continue. 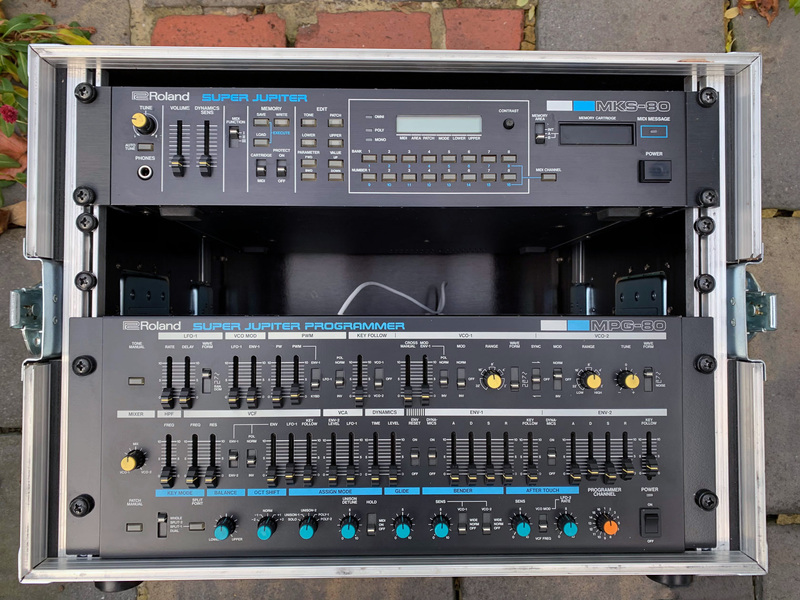 Both the operating panels MKS80 & MPG80 programmer are in very good condition as you would expect from a rack system, and are sold with the flight-case featured in the photos. 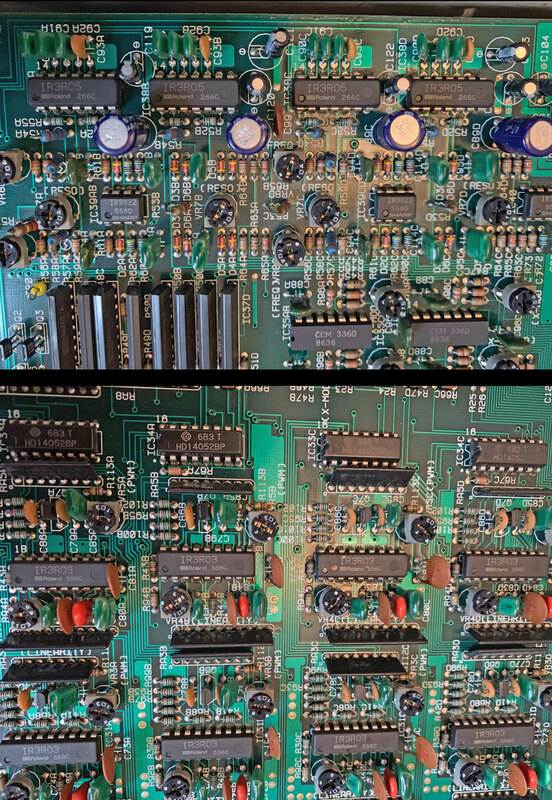 The programmer does show cosmetic damage, which we have highlighted in one of the pictures below, but these marks would normally be hidden when fully racked. 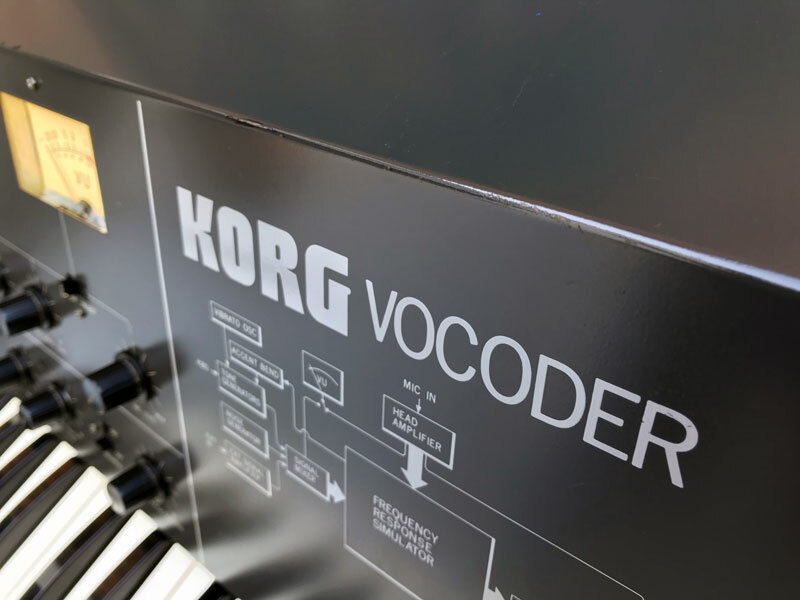 Both units work perfectly and contain many of their original patches, and they’re simple to set up in your studio and get to work with straight out of the box. 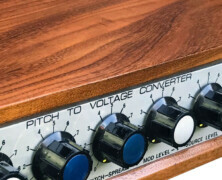 This combo sounds and operates like all MKS80 should, so if the sound is more important than looks, then this instrument will make a good studio workhorse for your vintage analogue poly needs. 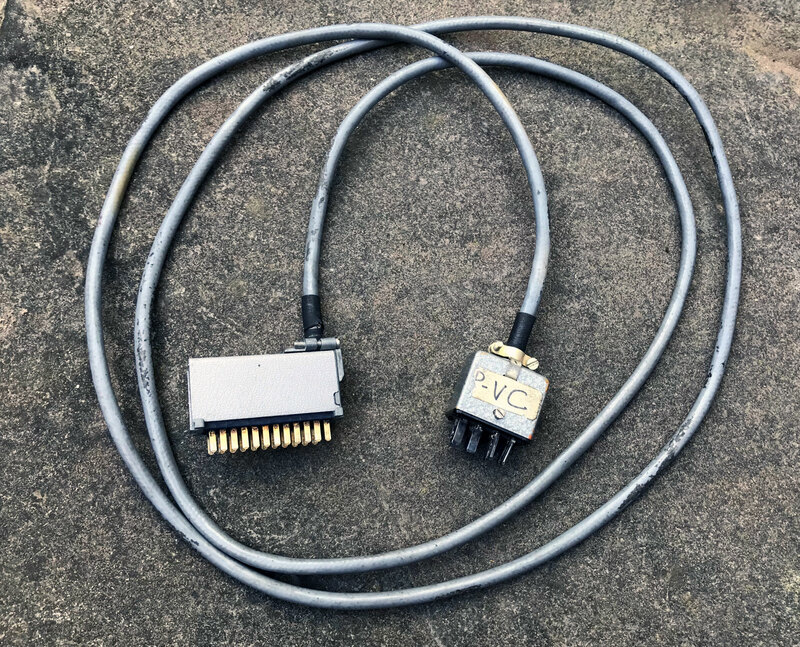 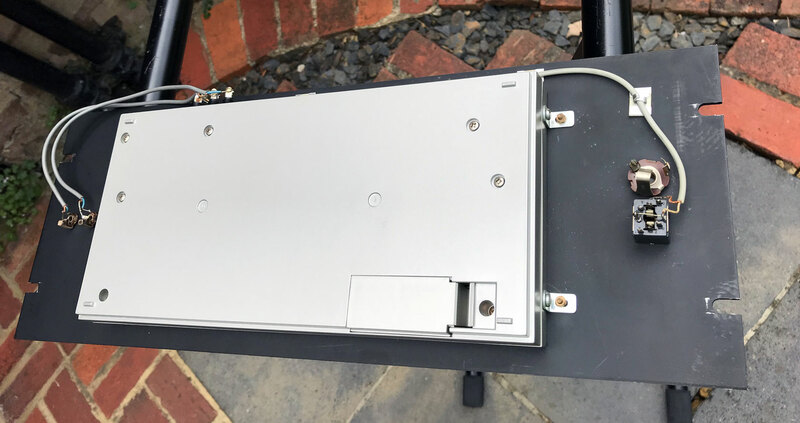 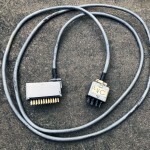 The MKS80 is an EU220V machine, so is supplied with the MPG80 interconnect cable and an IEC cable with UK-plug fitted. 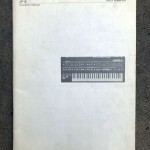 We will supply a copy of the user manual on PDF. 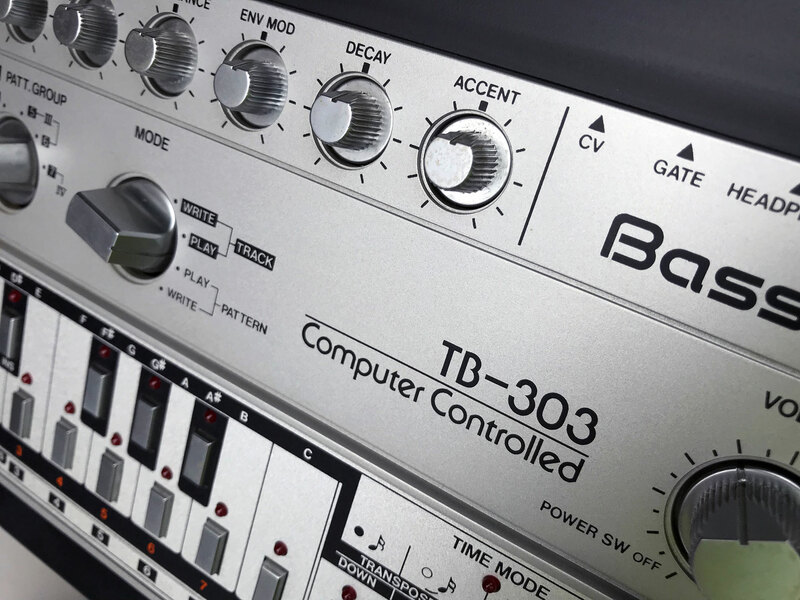 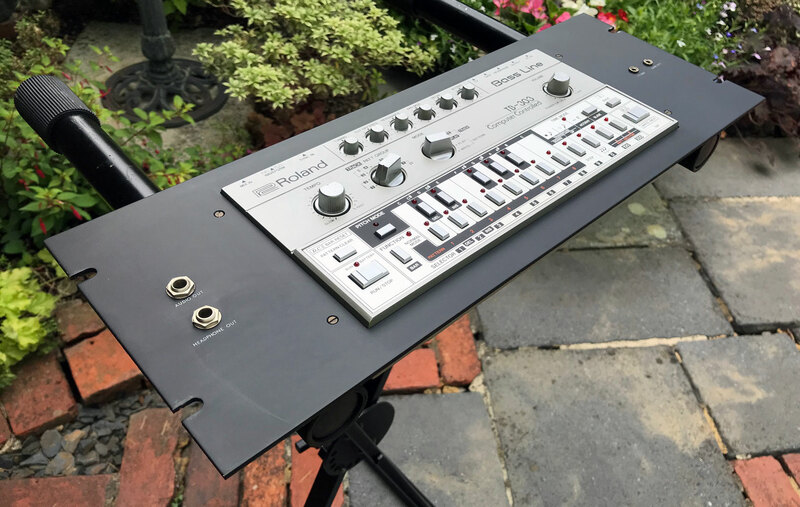 As the instrument is being Brokered through RL Music, it will be sold with a full 3-month warranty and can be shipped worldwide. 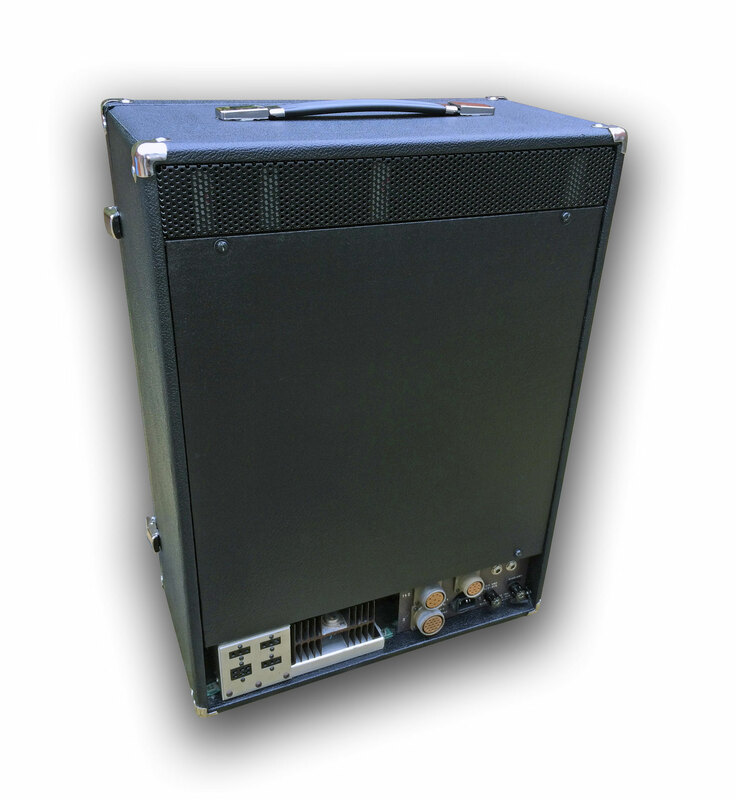 Availability: This MKS80/MPG80 combo is available for sale now. 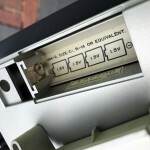 Click on the thumbnail for higher resolution photos of the actual MKS80/MPG80 for sale. 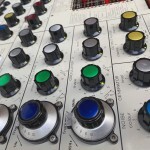 Servicing Status: A full service by KSR has already been carried out (June 2018), so the VC-10 is available for sale now. 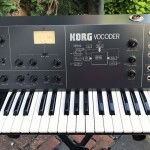 Remarks: A good condition example of the wonderful vintage Korg VC-10 Vocoder. 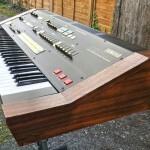 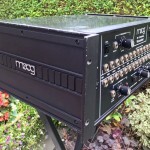 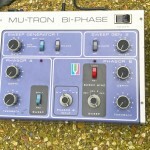 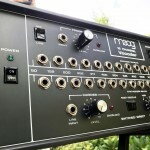 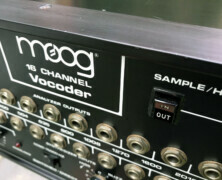 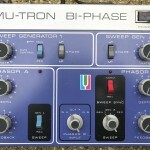 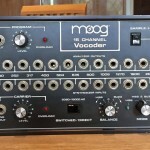 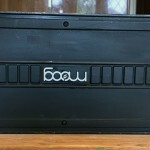 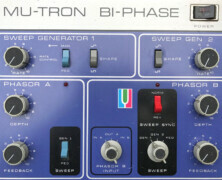 This unique and super little 20-band vocoder was made between 1978 and 1982 and followed the ‘MS Series’ design ethos. 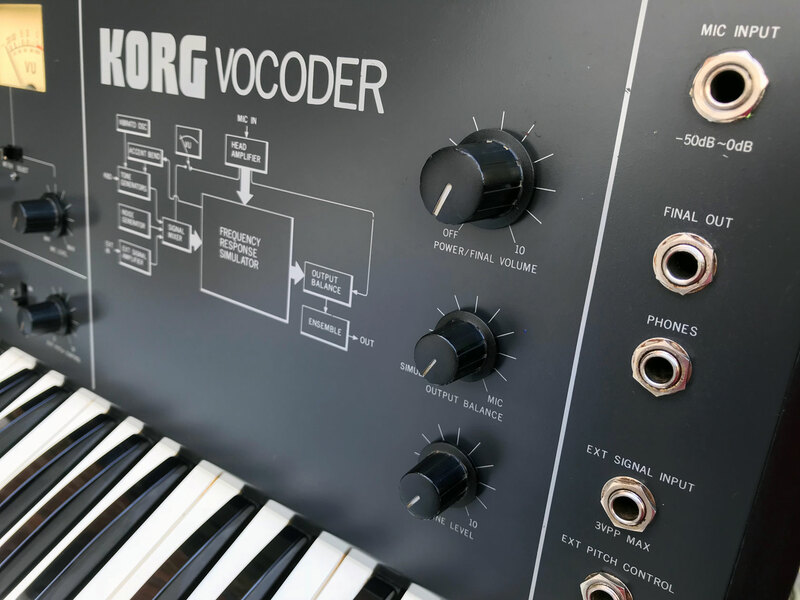 This is very simple but characteristic machine, and the built-in keyboard makes it easy to use as an effects processor as well as a more traditional human voice synthesizer. 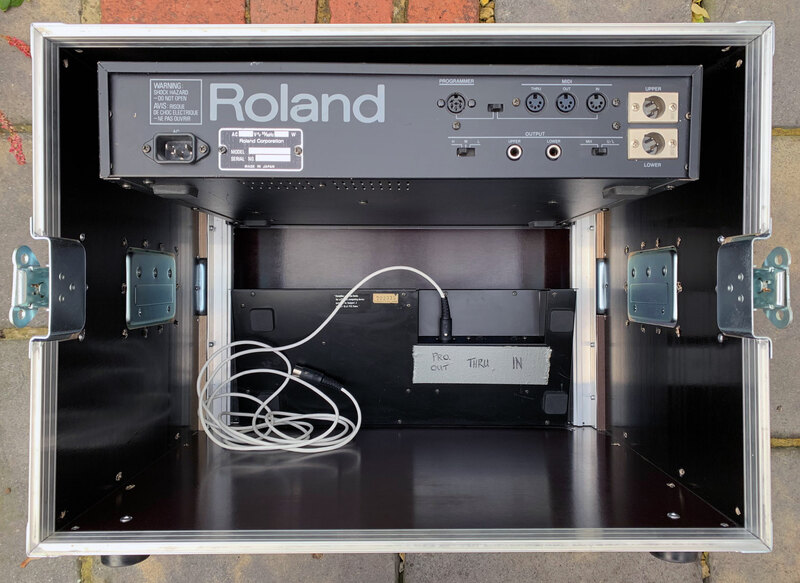 The Original gooseneck mic is, unfortunately, missing (common) but the original Korg mics that came with the unit were not of audiophile quality anyway, so you can use an unbalanced 1/4 jack input on the front panel. 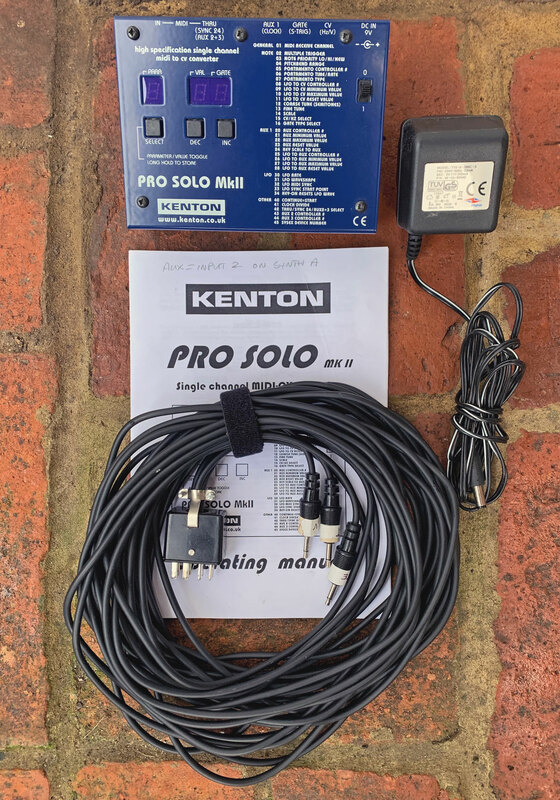 RL Music is able to fit a new XLR socket to replace the original proprietary 3 pin Korg mic socket, so please contact us for a quote to have this implemented if needed. 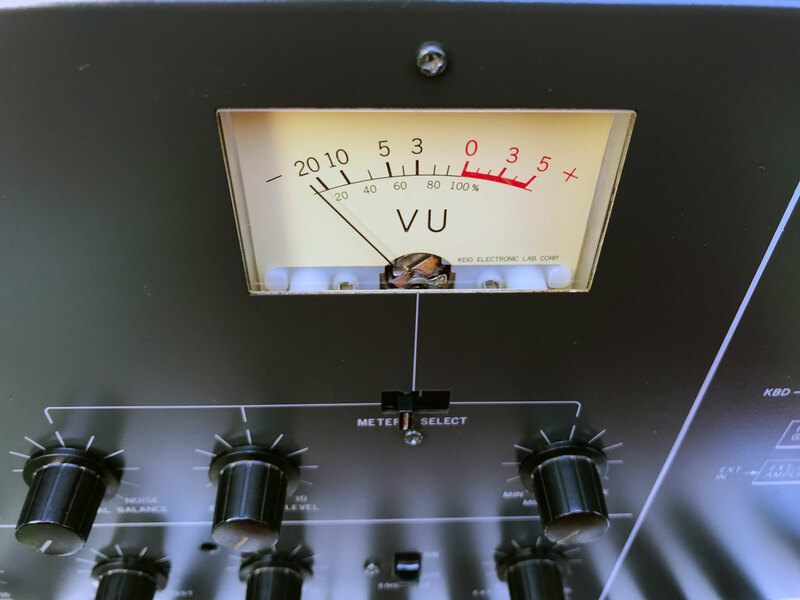 This VC-10 was owned by our clients family since 1994 and it had been in constant use and maintained regularly during their ownership at their home studio, up until quite recently. 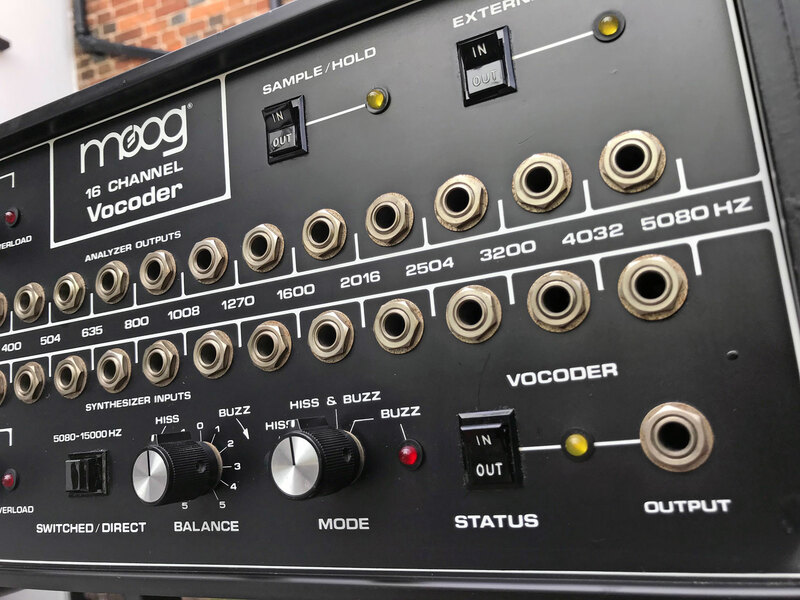 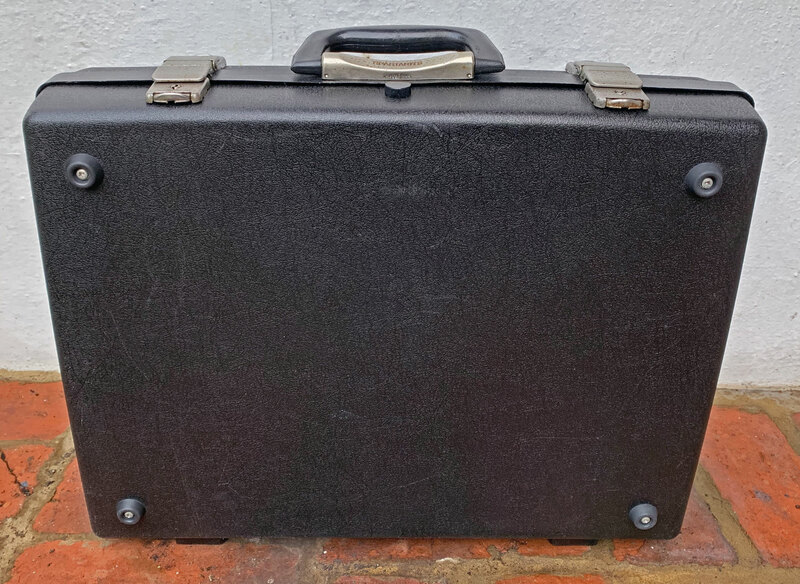 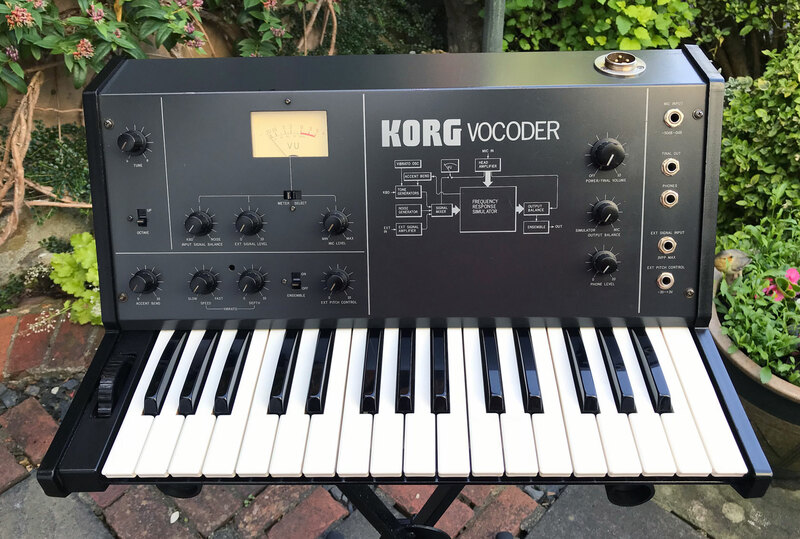 Cosmetically, this 37+ year-old vintage analogue vocoder is in good original condition and shows the normal amount of wear for an instrument of this age, and has been priced to reflect this. 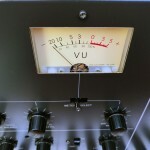 As mentioned above, KSR has only just fully serviced the VC-10, so it’s 100% perfect operationally. 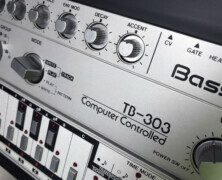 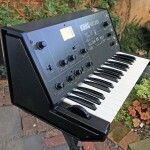 This Korg VC-10 operates on EU 220V. 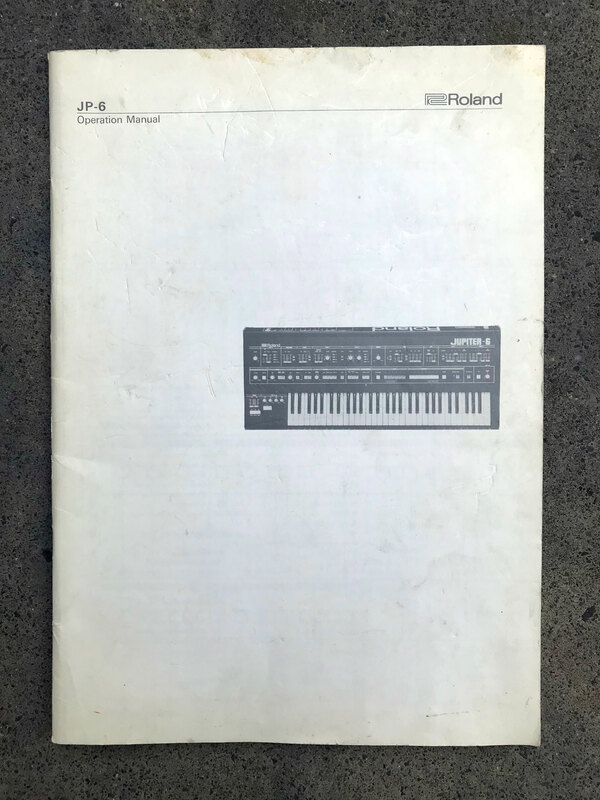 We do have a user manual (in PDF format). 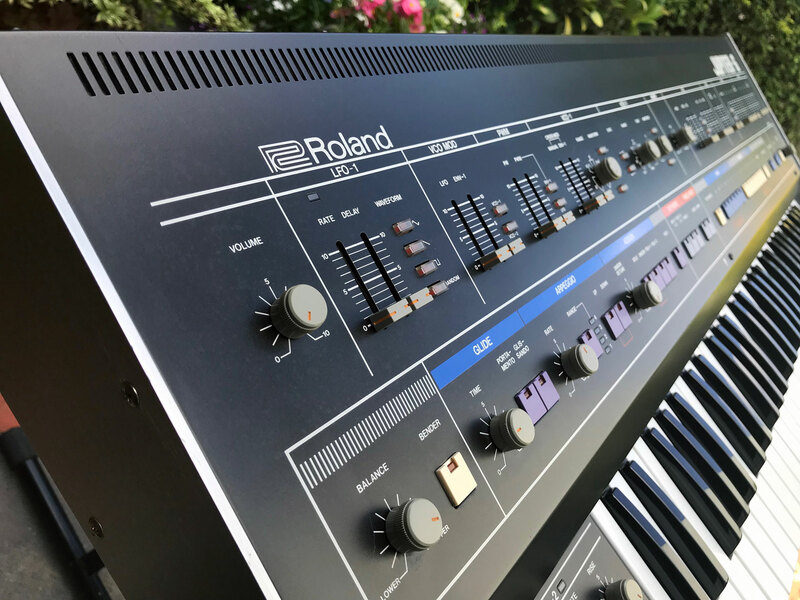 As the instrument is being Brokered through RL Music, it will be sold with a full 3-month warranty and we can ship worldwide. 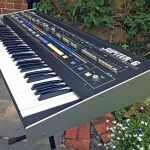 Availability: This Korg VC-10 is available for sale now. 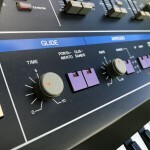 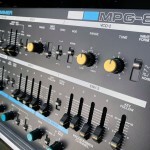 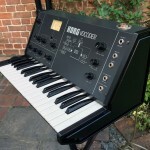 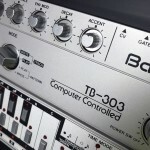 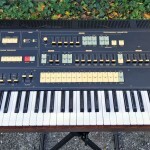 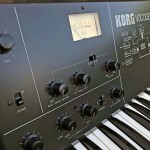 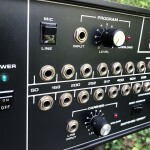 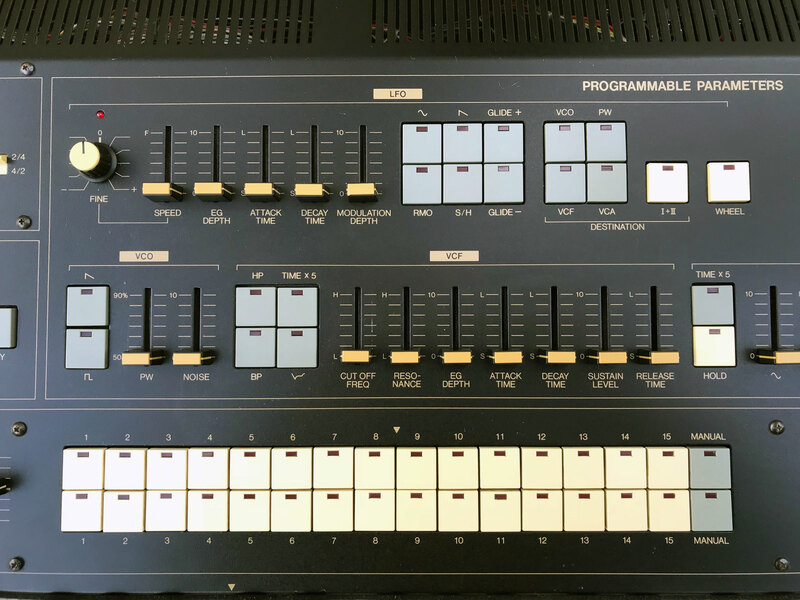 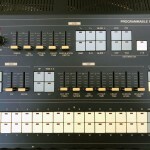 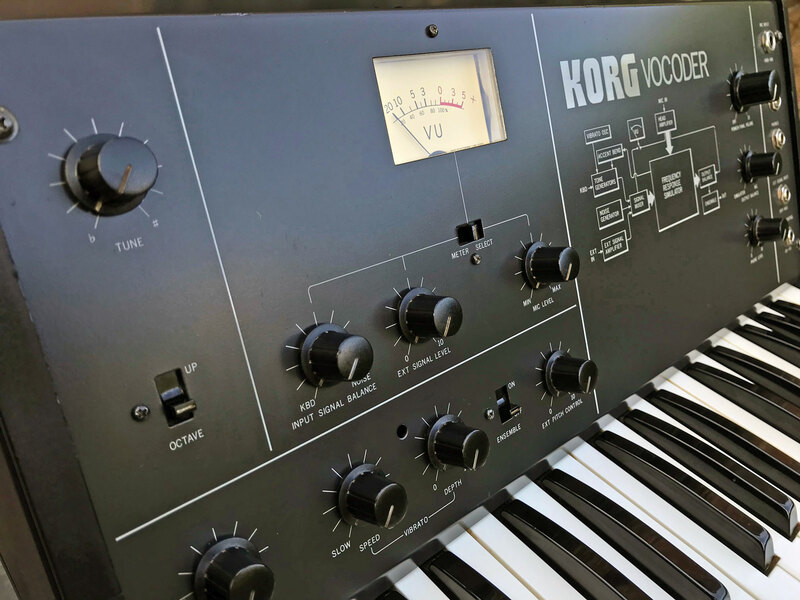 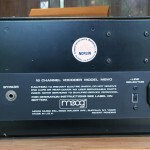 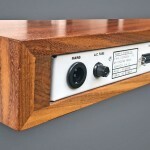 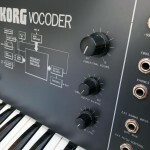 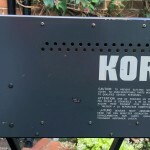 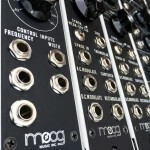 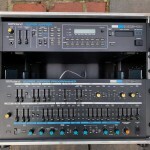 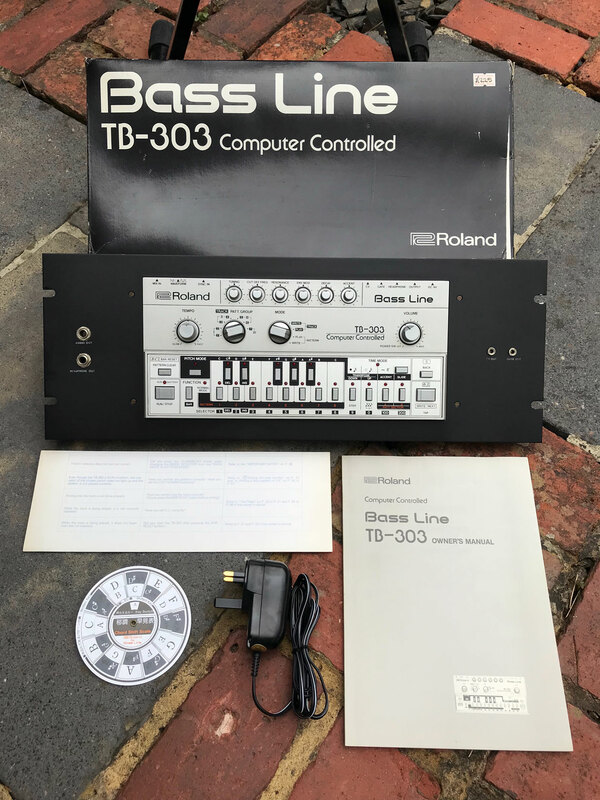 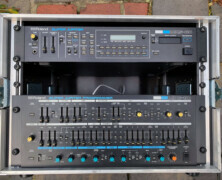 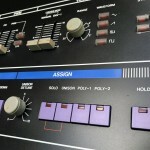 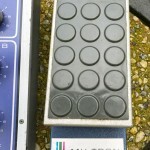 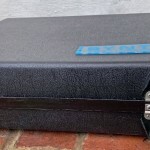 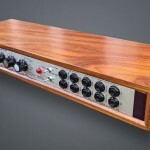 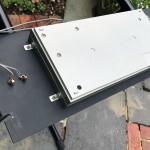 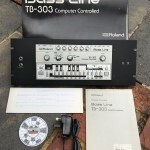 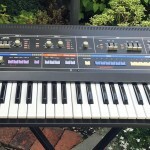 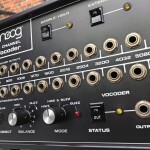 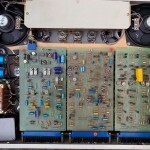 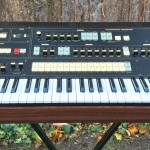 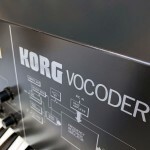 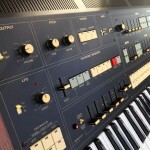 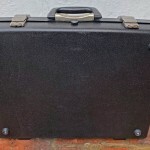 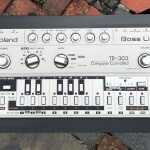 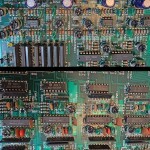 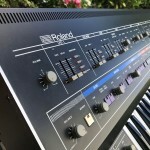 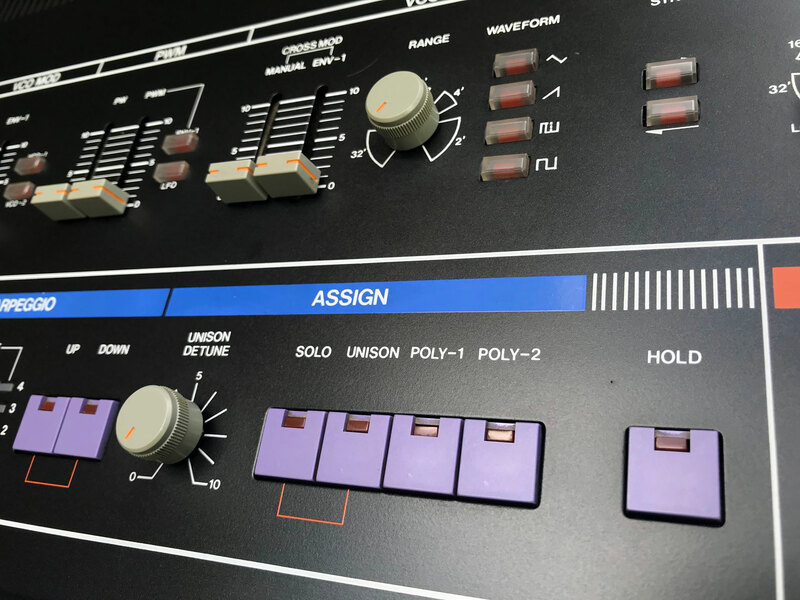 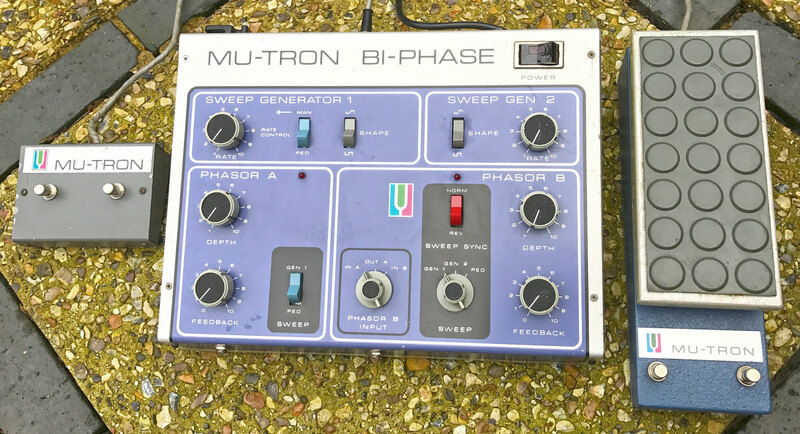 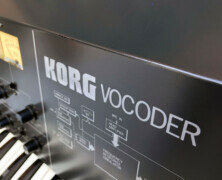 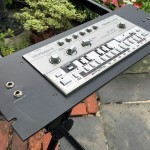 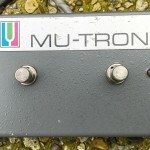 Click on the thumbnails for higher resolution photos of the actual Korg VC-10 for sale. 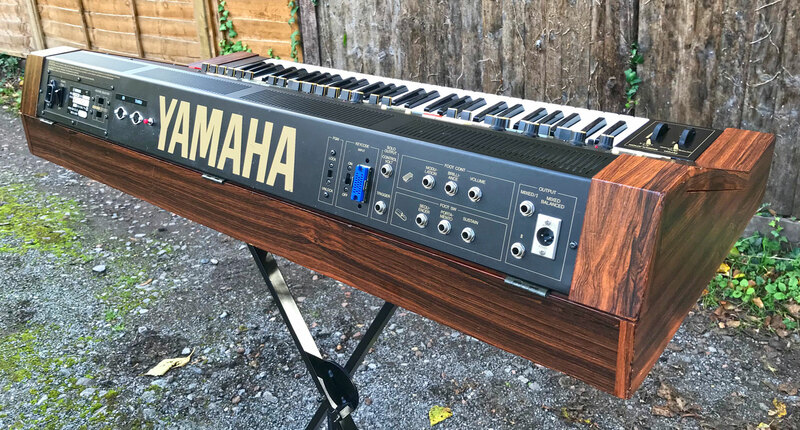 Came into stock: Available from RL Music as at 13th July 2018. 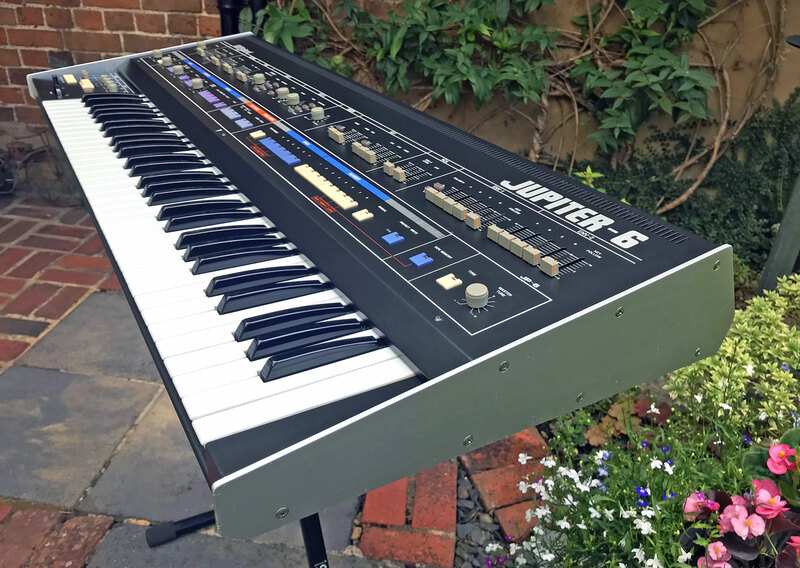 Restoration Status: A full service by KSR has already been carried out (completed in July 2018), so this Jupiter 6 is ready for sale now. 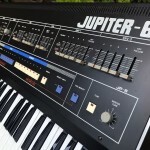 Remarks: This Jupiter 6 was purchased new by our client in the early 1980s, and only ever used in the home. 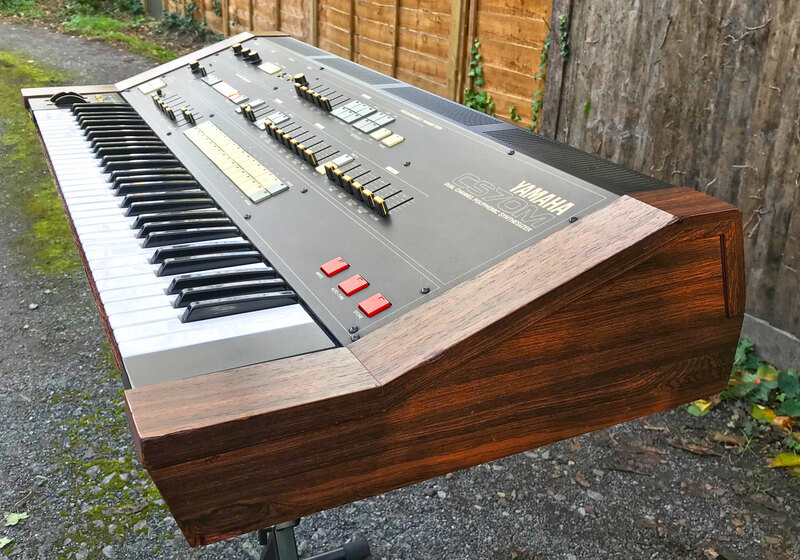 The cosmetic condition is outstanding and the whole synth only shows very light indications of use & ware – this is remarkable for a keyboard over 35 years old! 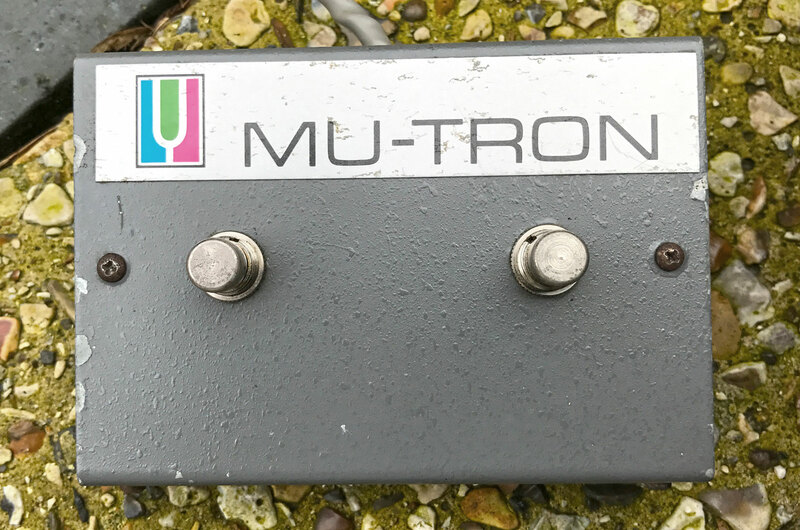 We would grade this as a 9 out of 10 cosmetically, Collector-Grade! 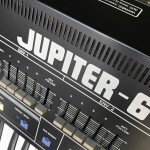 The Jupiter 6 has been a hugely popular polysynth since its arrival in 1983 and offers aficionados that beautiful vintage polyphonic analogue Roland sound for very reasonable cost, certainly when compared to its sibling, the Jupiter 8. 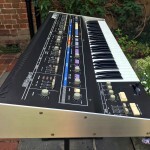 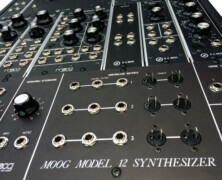 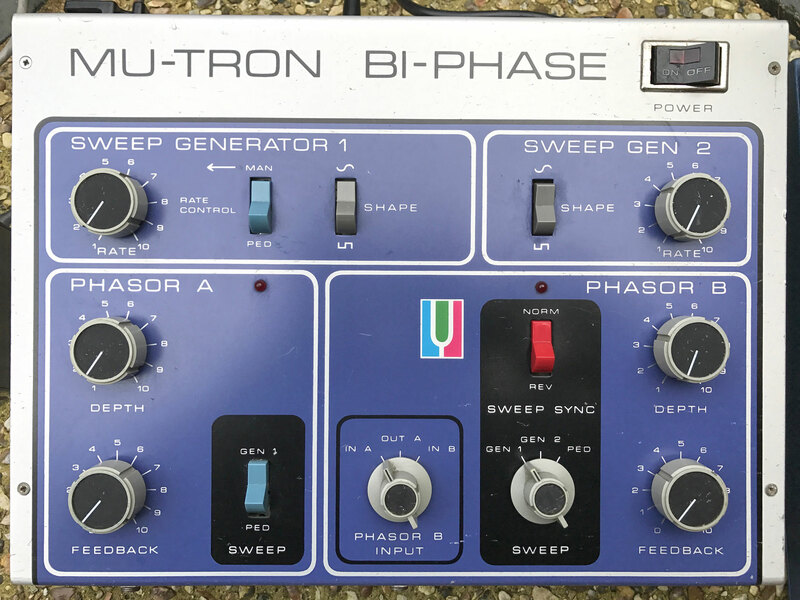 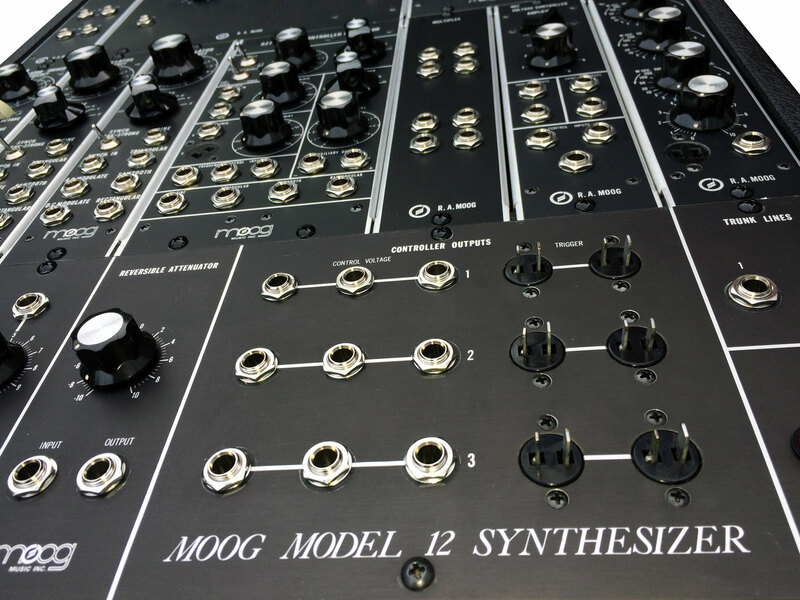 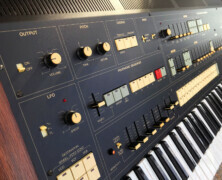 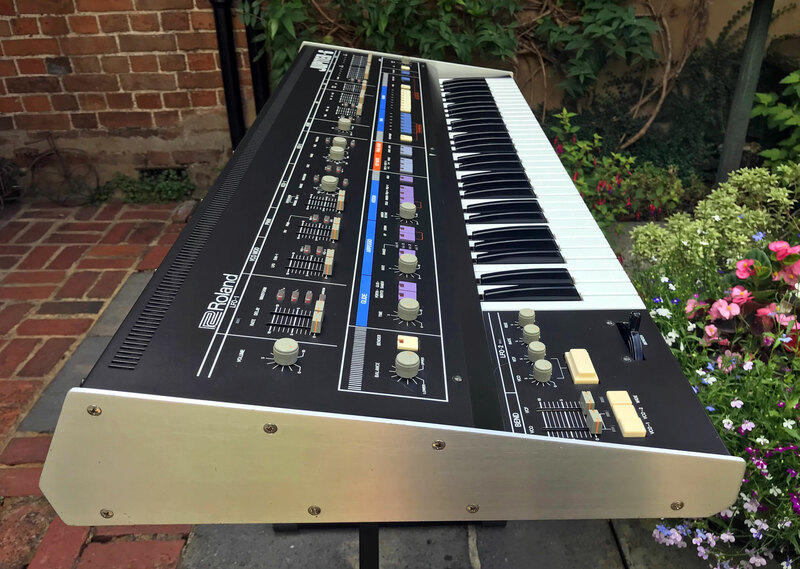 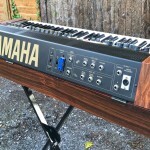 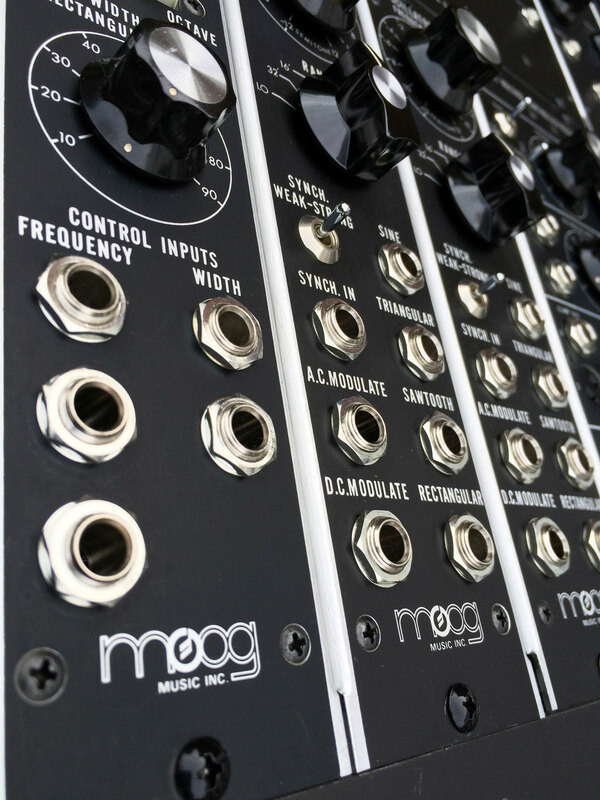 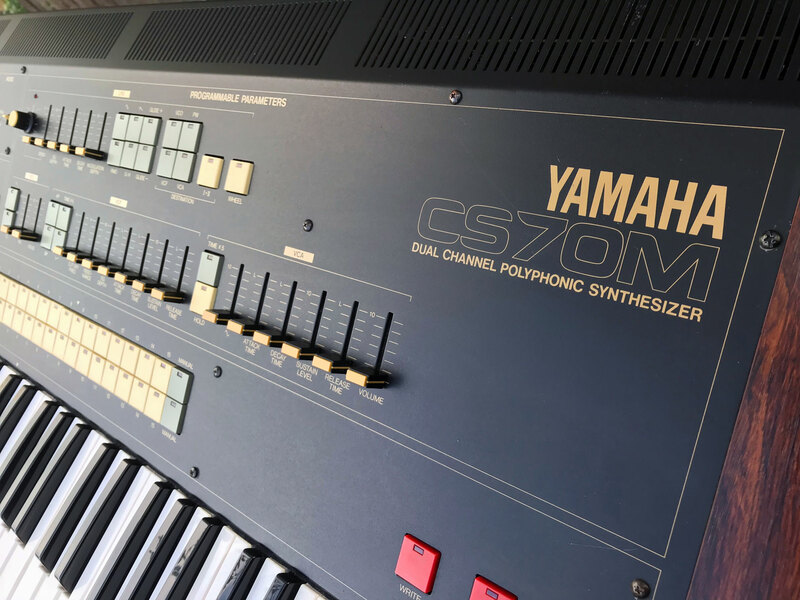 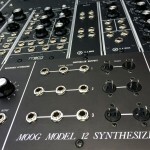 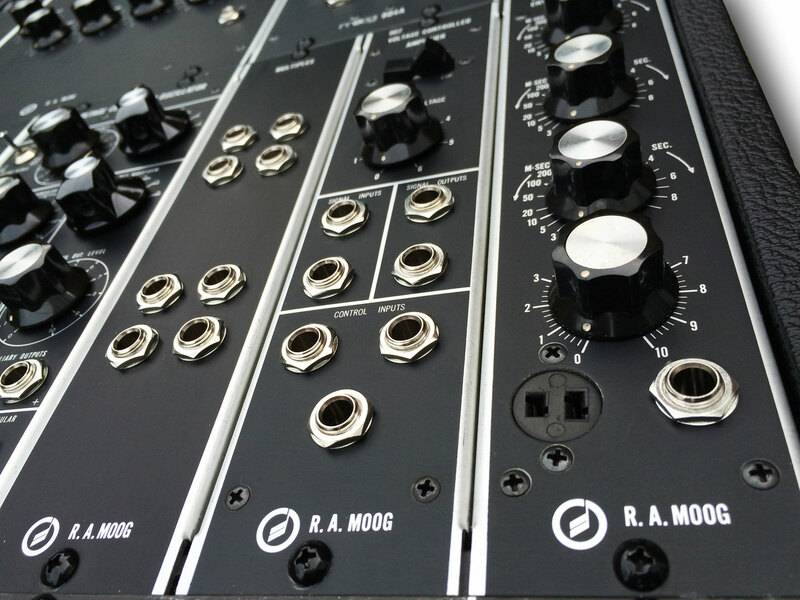 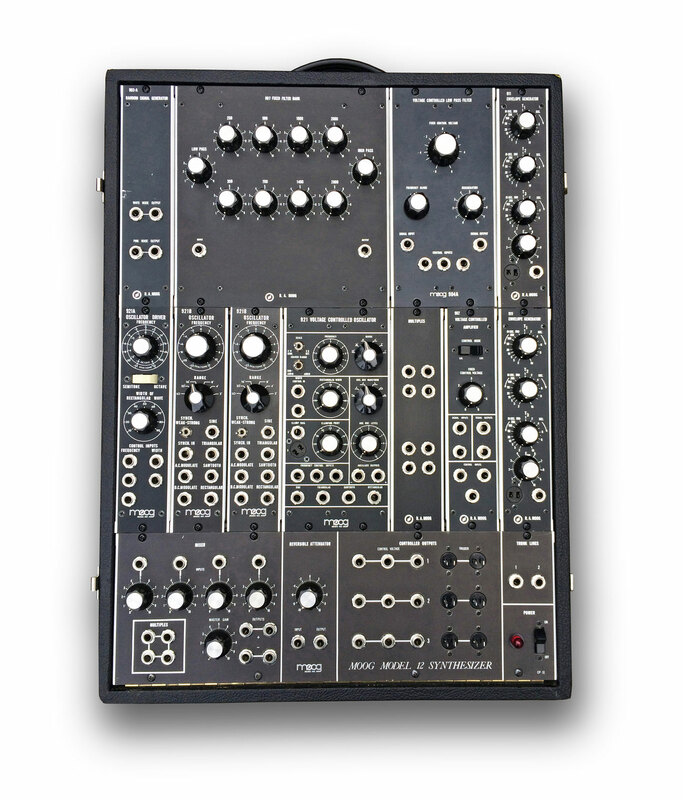 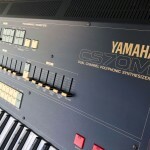 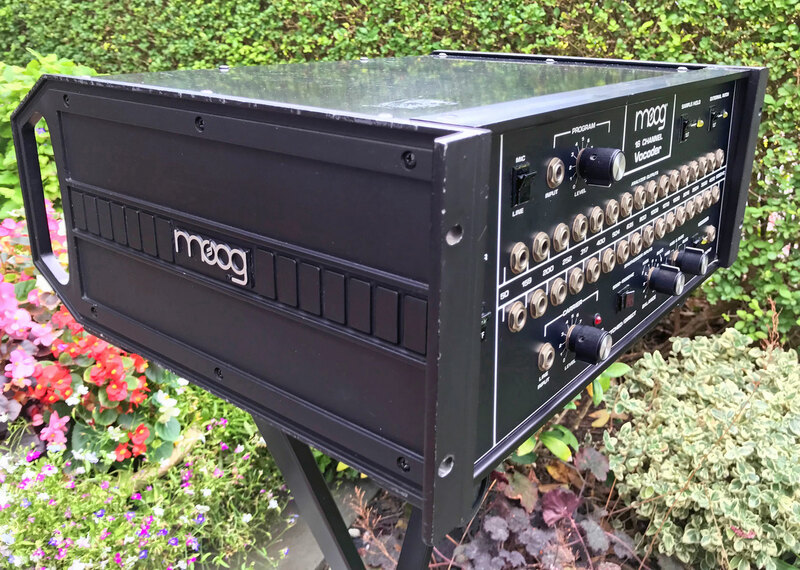 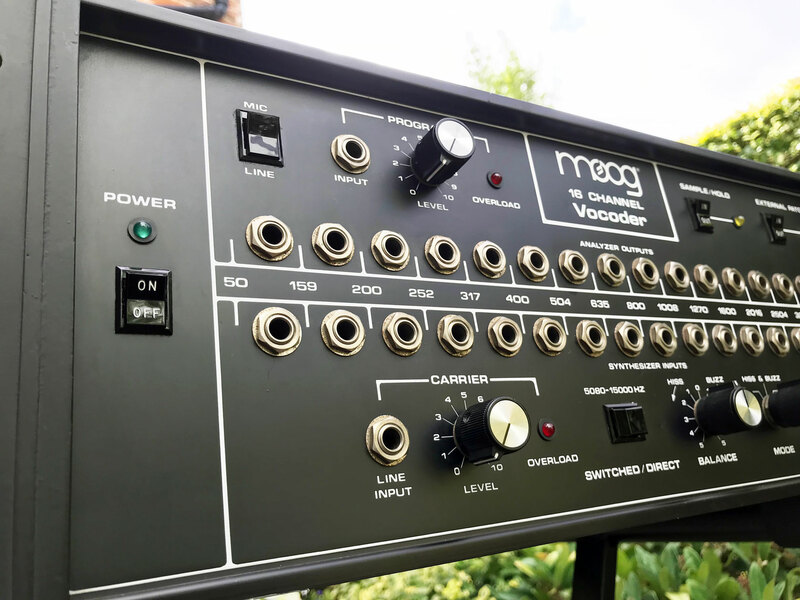 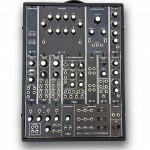 Prices for these models in recent years has seen a significant uplift as vintage polysynths are getting more and more rare to find in good condition, let alone the condition of this example we have available. 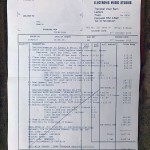 This JP6 has not had any modifications to its factory spec. 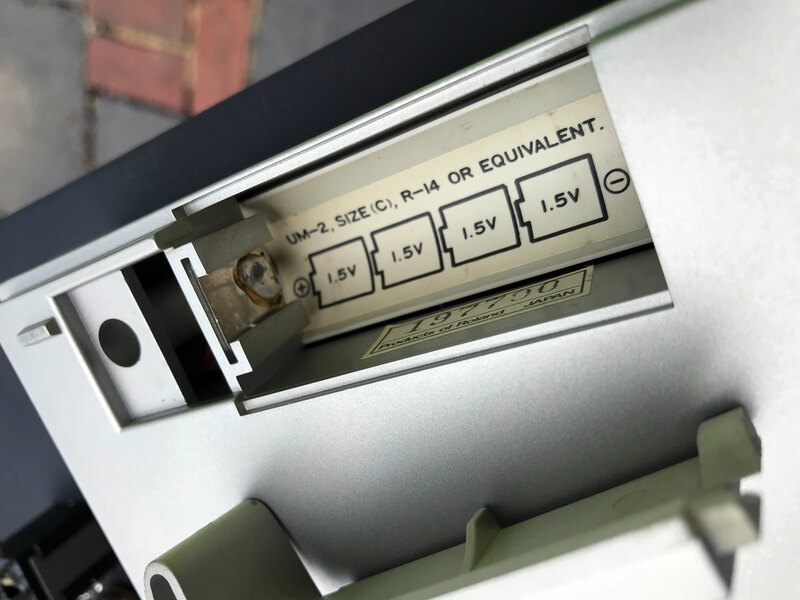 This is often important for buyers who prefer to either leave them as stock or upgrade them according to their own needs & budget, depending on what retrofit solutions may be available in the marketplace. 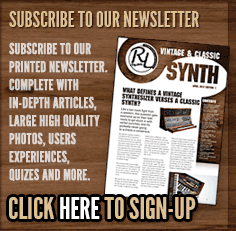 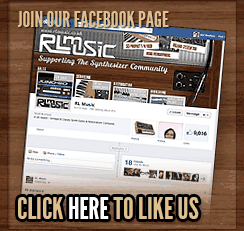 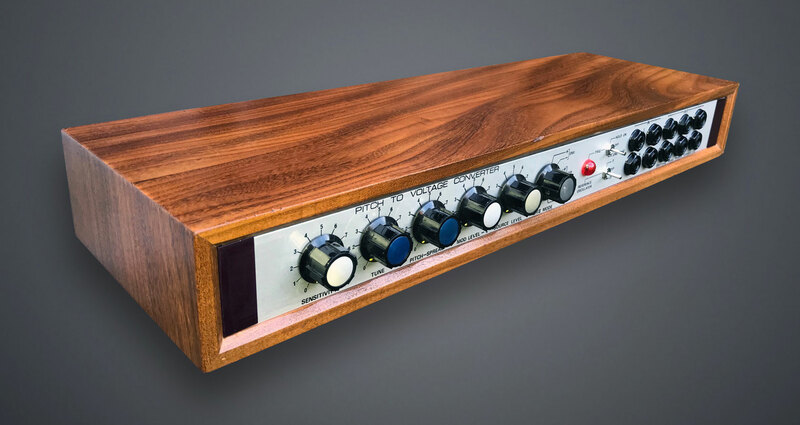 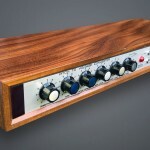 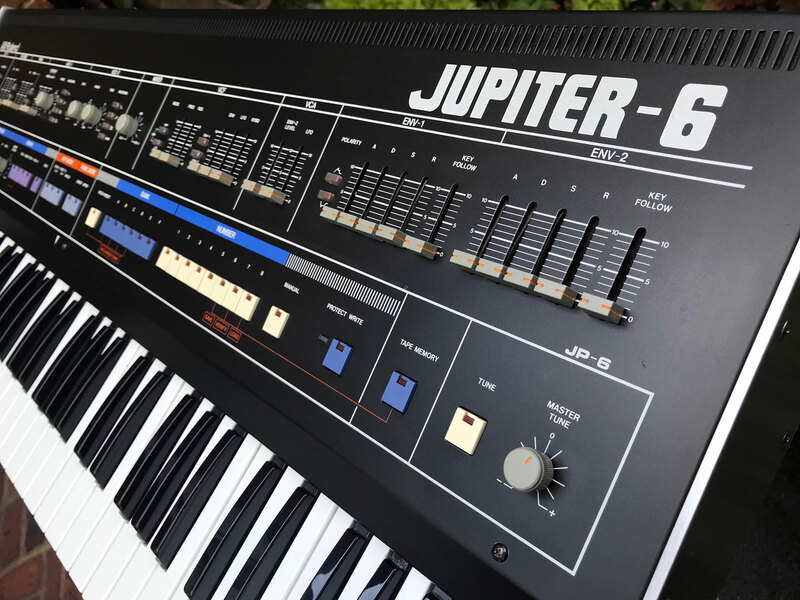 The Jupiter 6 is a professional-grade vintage instrument that’s only ever going to become more sought after and rarer, so here is your opportunity to buy a beautiful condition example, fresh from the hands of a master synth restorer (Kent Spong), and fully guaranteed by RL Music. 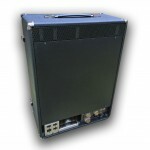 Runs on EU 220V or 110V (switchable) and is supplied with the original Roland owners manual. 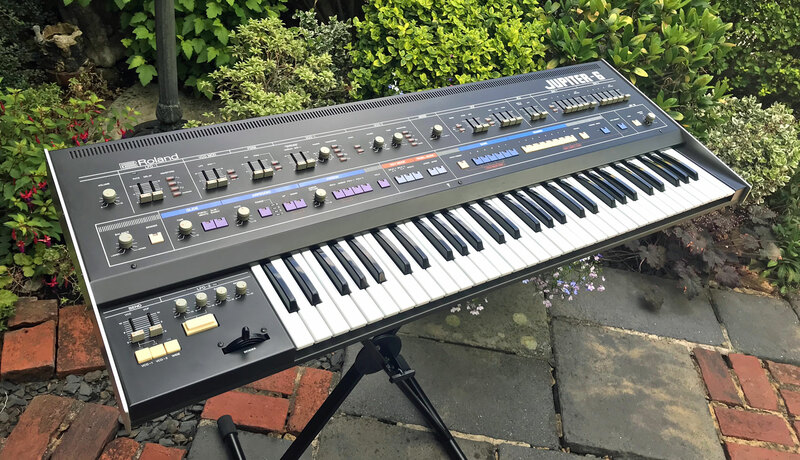 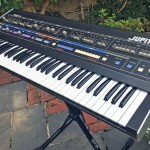 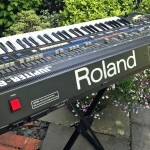 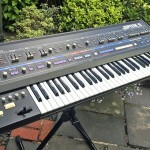 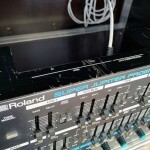 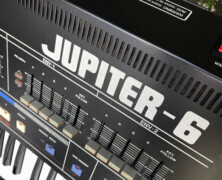 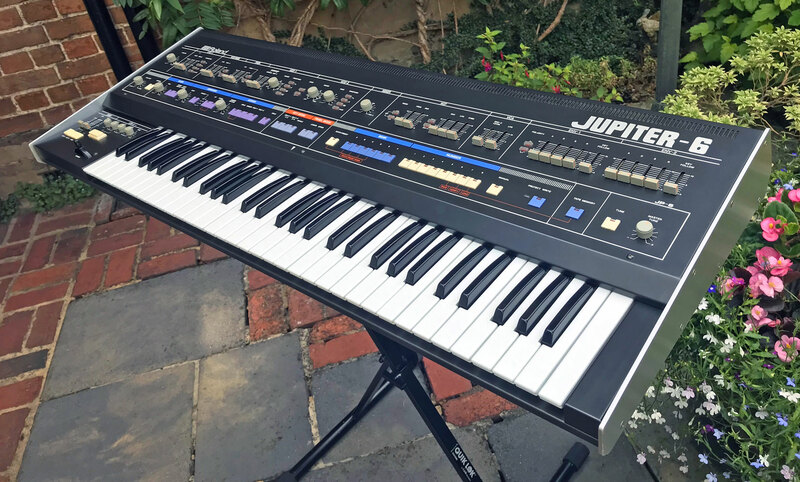 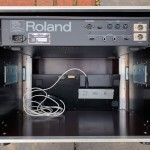 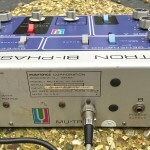 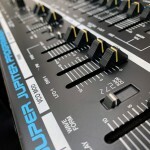 Availability: This Roland Jupiter 6 is available for sale now.